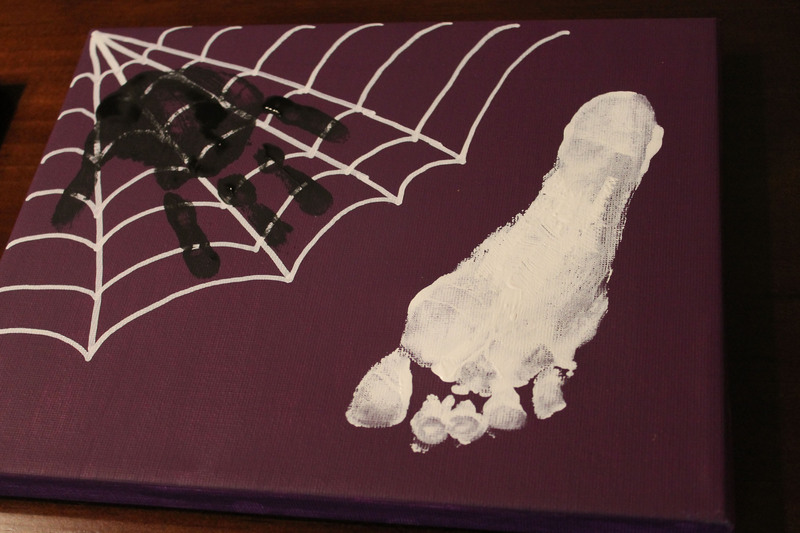 A friend of mine created some Halloween canvas art using her son’s hand print and foot print. I’ve seen this project posted on Pinterest, too. She did two separate pieces of art (one hand print spider and one foot print ghost). 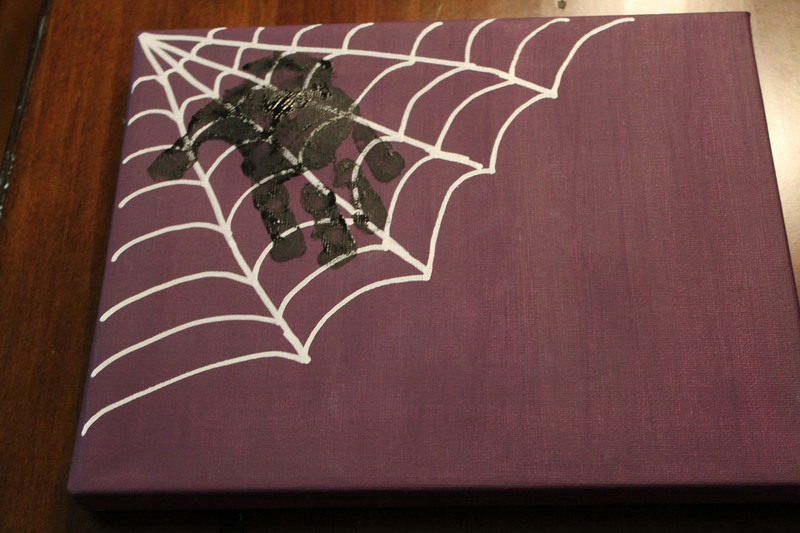 Since I only had one canvas per child, I decided to combine the spider and ghost on one canvas. 1.) 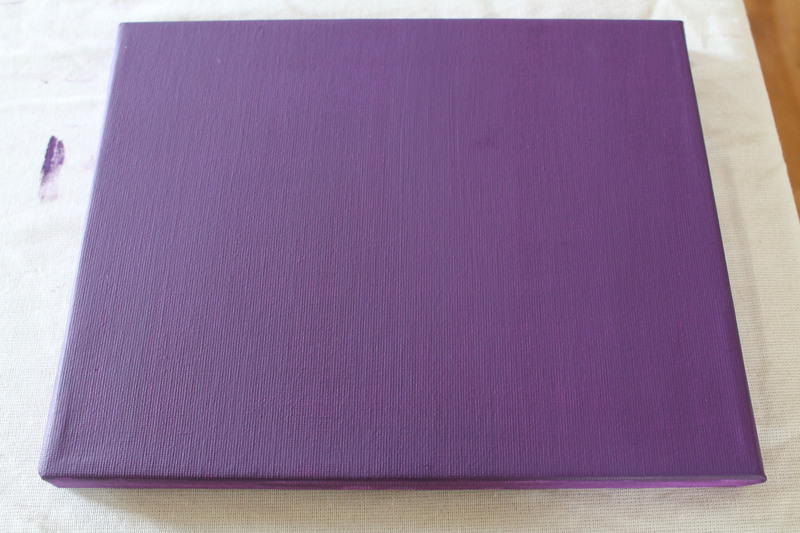 Canvas – any size that will fit a hand print and a foot print. 2.) 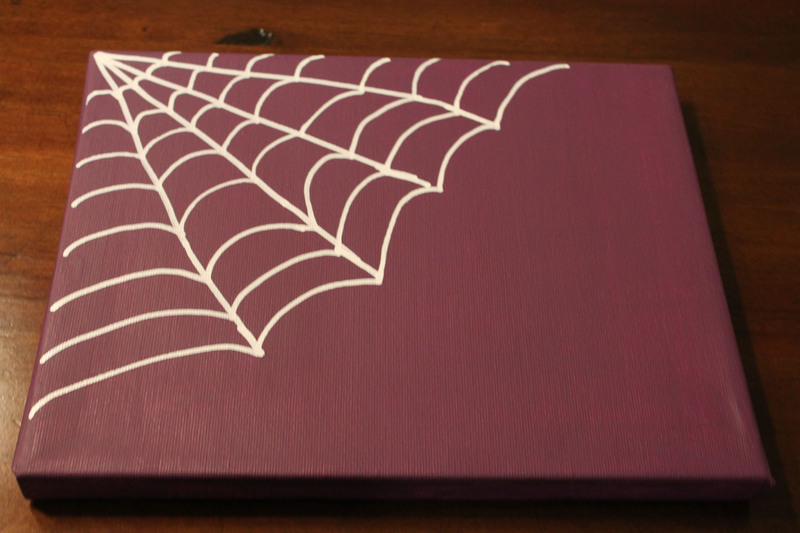 Acrylic paint – I used purple for the background, white for the ghost, and black for the spider. 7.) Wooden letters – optional. 1.) Paint your canvas in any color you like. I chose a deep purple. 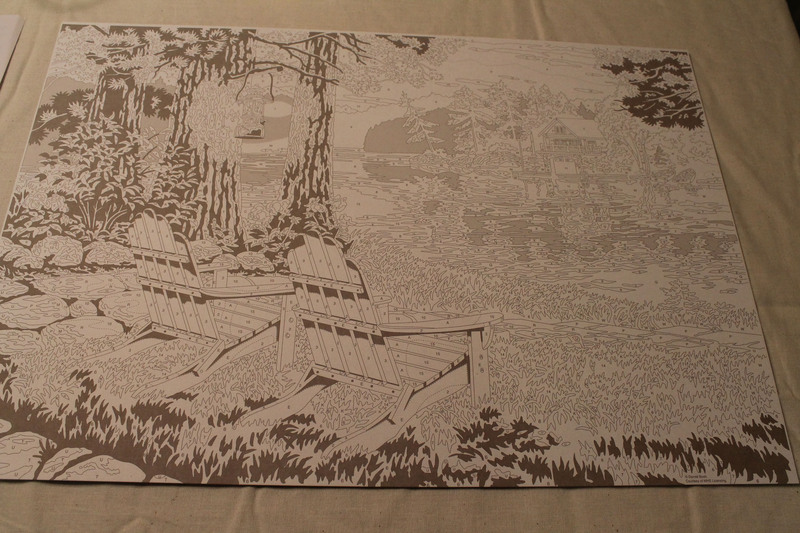 I ended up doing 6 layers of paint to get a good background. 2.) Draw a spider web using the white paint pen. 3.) Using a foam paint brush, paint your child’s hand black and stamp it on top of the spider web. Make sure to paint on a good thick layer of paint and stamp immediately for best results. It’s helpful to have a second adult on hand to quickly whisk away your child to clean off their hands and feet. 4.) Using a foam paint brush, paint your child’s foot white and stamp it on the canvas. 5.) Allow time for the ghost and spider to dry. 6.) Glue googly eyes on the spider and paint on a mouth. 7.) Paint eyes and a mouth on the ghost. I used purple, but black would look good, too. 8.) 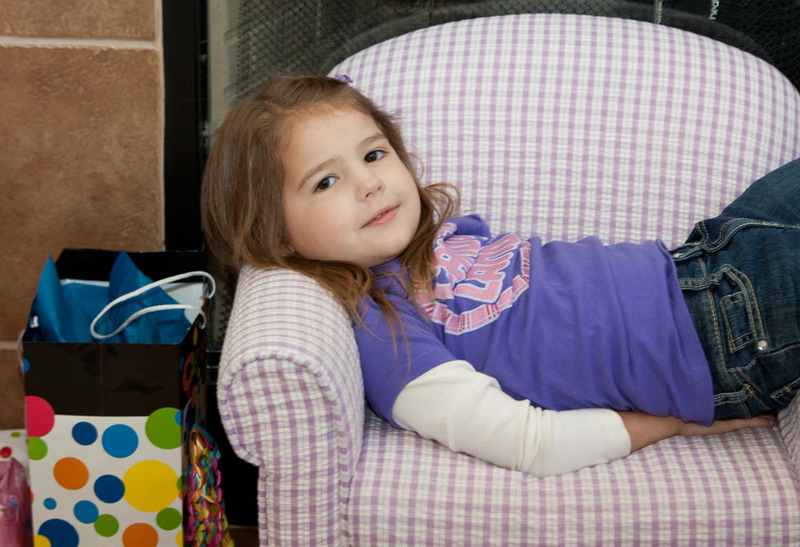 Personalize the artwork by writing your child’s name and year at the bottom. 9.) 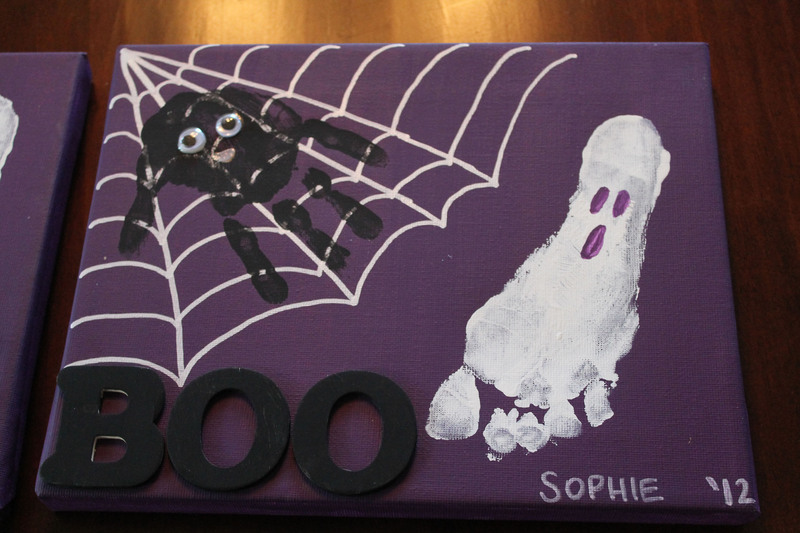 Use a paint pen to write “BOO” or “EEK” somewhere on the canvas. I didn’t trust my handwriting, so I painted some wooden letters black and glued them on. I put together one year’s worth of dates (one date per month) for my husband as a Valentine’s Day present. 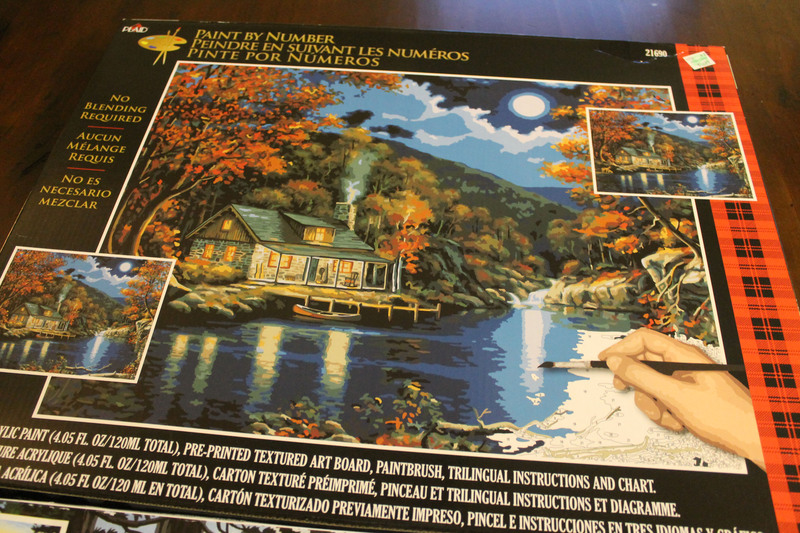 I’ve always wanted to do a paint-by numbers painting. My husband is great at drawing. I’m not such a great drawer, but I thought it would be fun to give this a shot! Our date was relaxing! 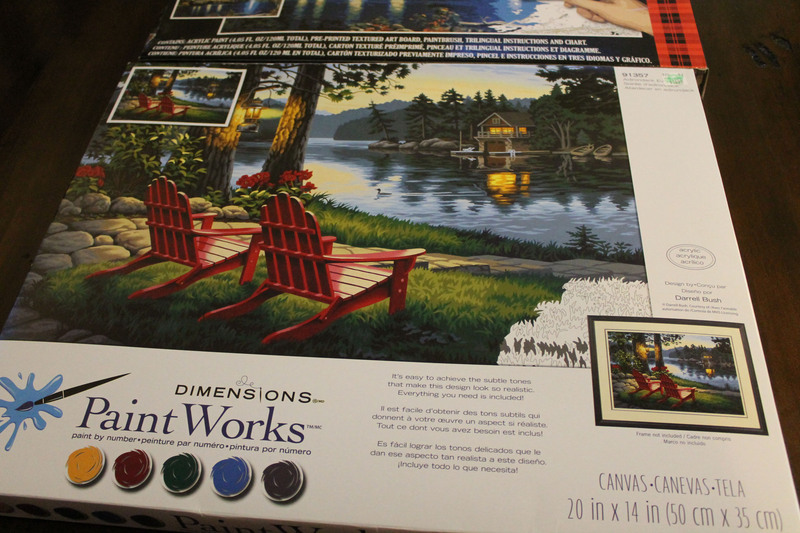 I purchased two paint by numbers kits for us to paint. We painted while listening to music. 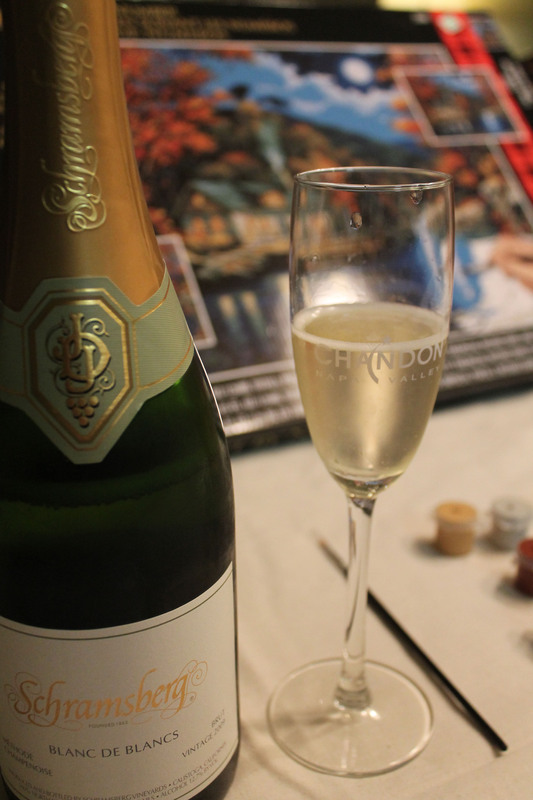 We also enjoyed a bottle of sparkling wine that we purchased during a recent trip to Napa Valley! The date card read “This will be a low key date at home. 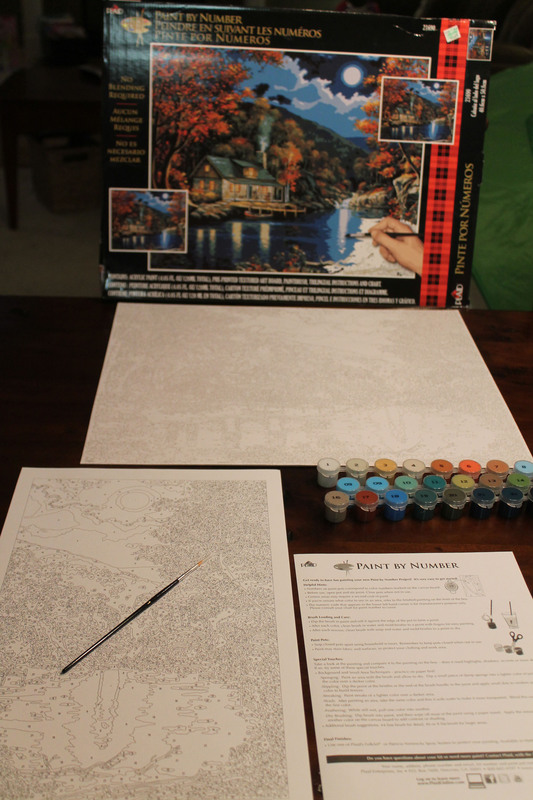 We’ll drink wine and paint by numbers. Love, Lisa.” We worked on our paintings after the girls went to bed. We WAY underestimated the amount of time it would take. 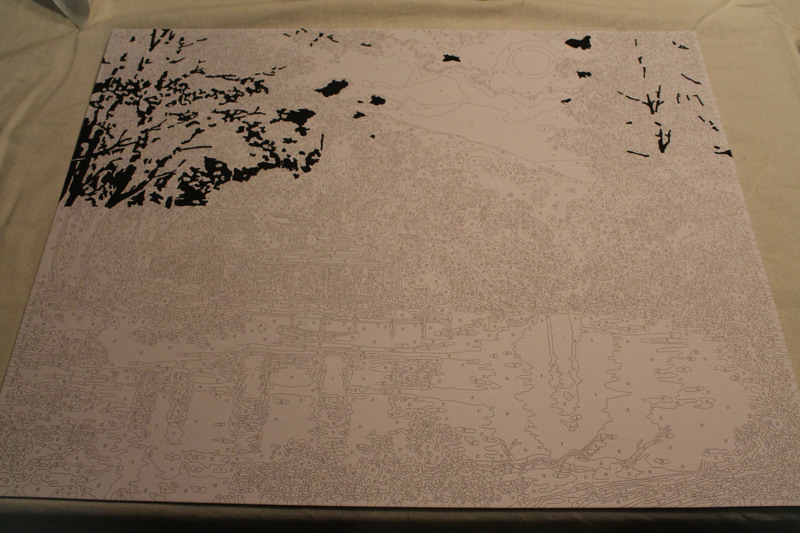 Take a look at what we accomplished after 2 hours (see photos below). 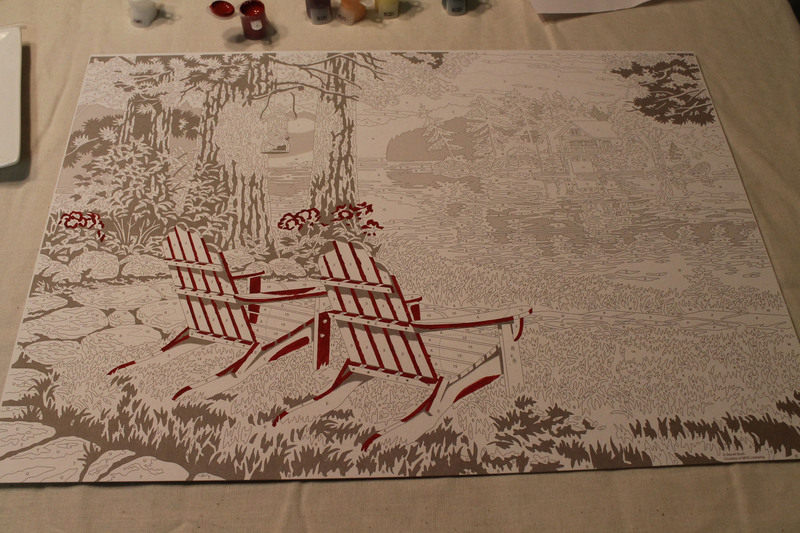 I have 22 different paint colors in my kit and I only finished 1/3 of one color in 2 hours! Yikes! I guess this will be the gift that keeps giving. It might take a year, but we will get these done! September 2012 – due to a busy September, (birthdays, trip to Denver, etc.) we will be going on this date at the end of October (if my 2 year old will start sleeping again and I can leave her with a sitter). I know it’s been FOREVER since my last post. Once you read this post, you will see what I’ve been up to. 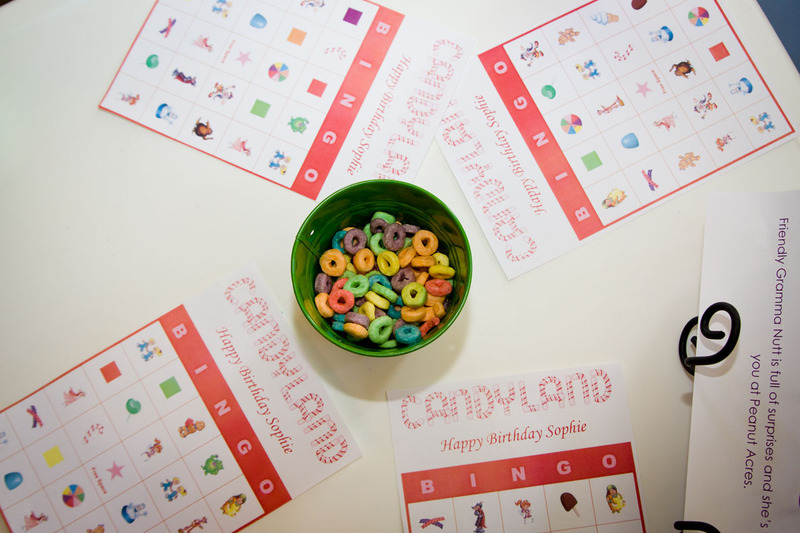 I’ve been working really hard on finalizing the details of Sophie’s Candyland birthday party. 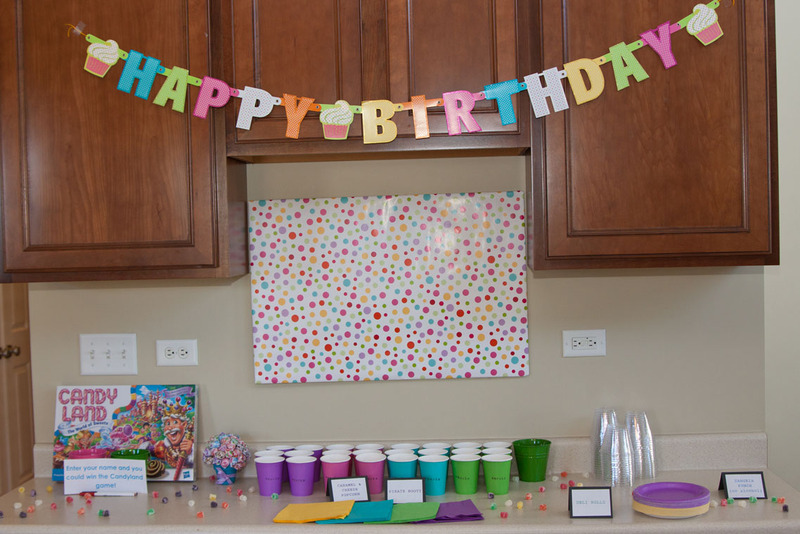 To plan this party, I used Pinterest to “pin” a bunch of ideas. I sorted through my pins and decided which ideas to use. I did come up with a few original ideas, too! 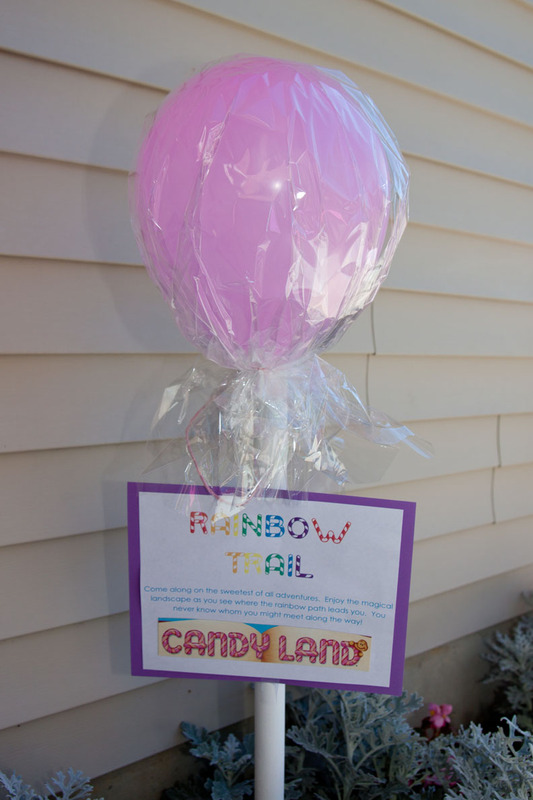 I took the game board and made stations for each stop along the rainbow trail. 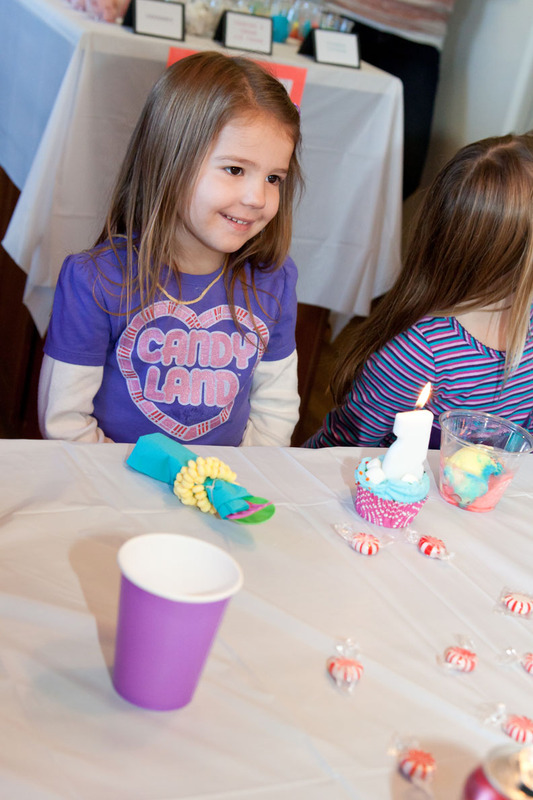 The party was a lot of fun! 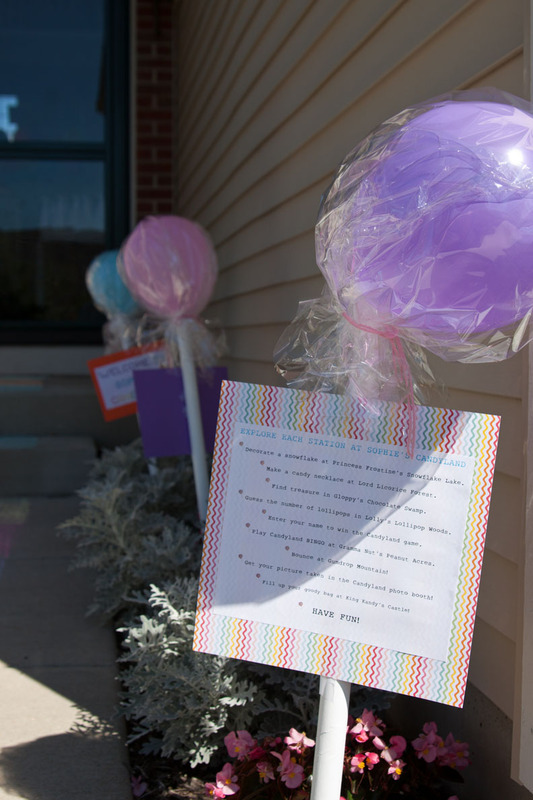 I hope you enjoy reading about the party as much as I enjoyed putting it together! The party has come and gone now, so here’s a peak at the details. 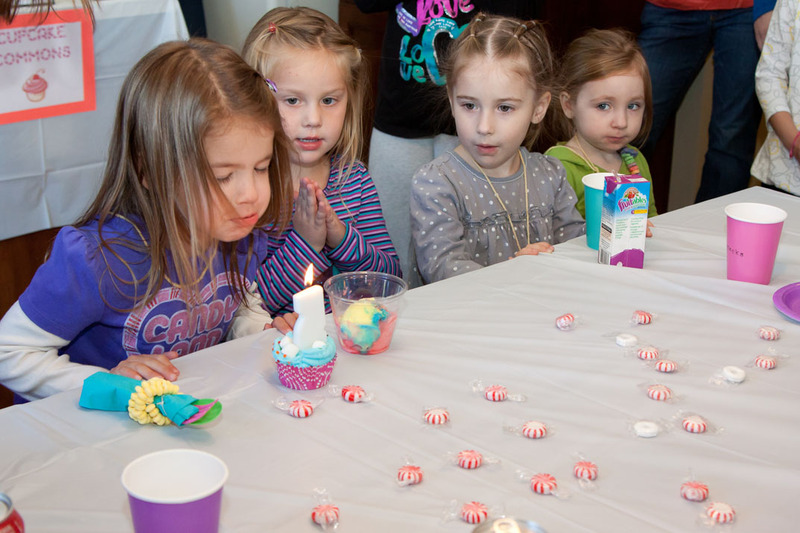 Singing Happy Birthday to Sophie! 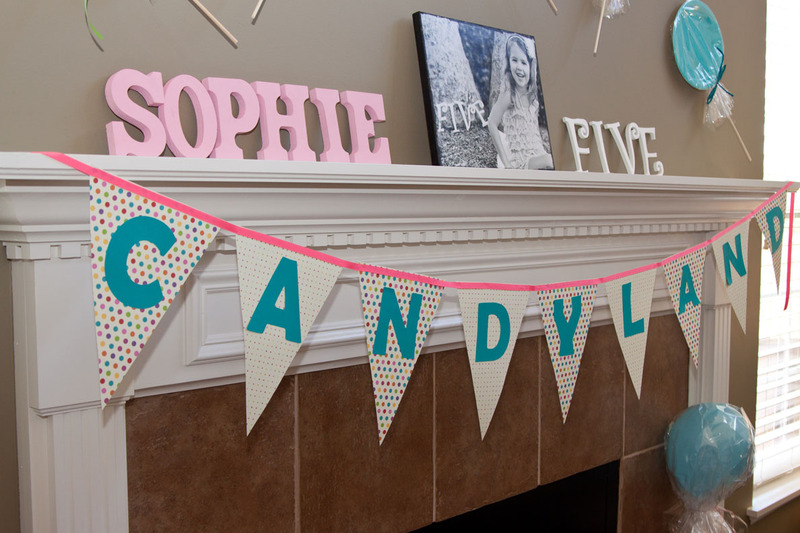 I made a pennant banner that read “Candyland”. I cut out triangles from scrapbook paper and used my brand new Silhouette Cameo to cut out the letters. 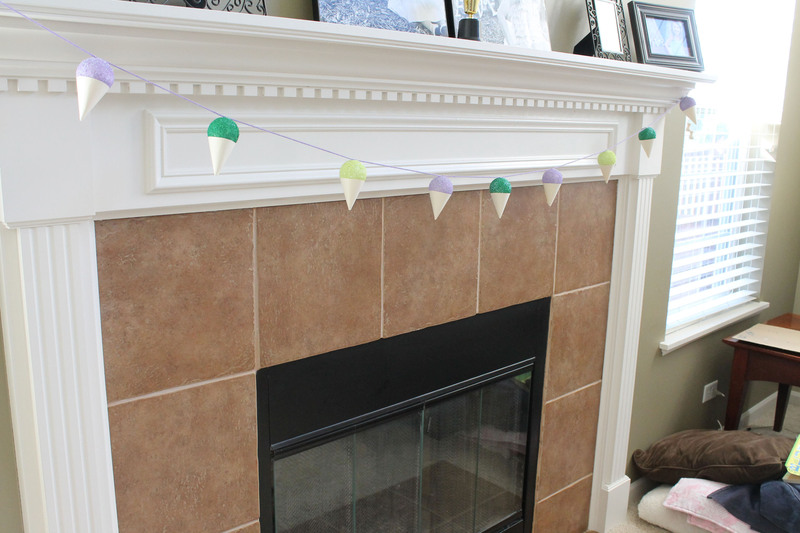 I hot glued the banner to ribbon and taped it on the fireplace. 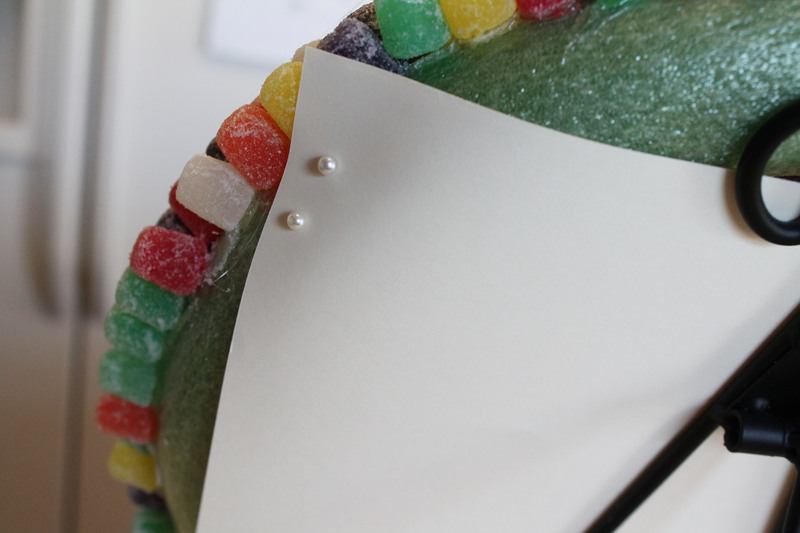 I made some fun paper plate lollipops. 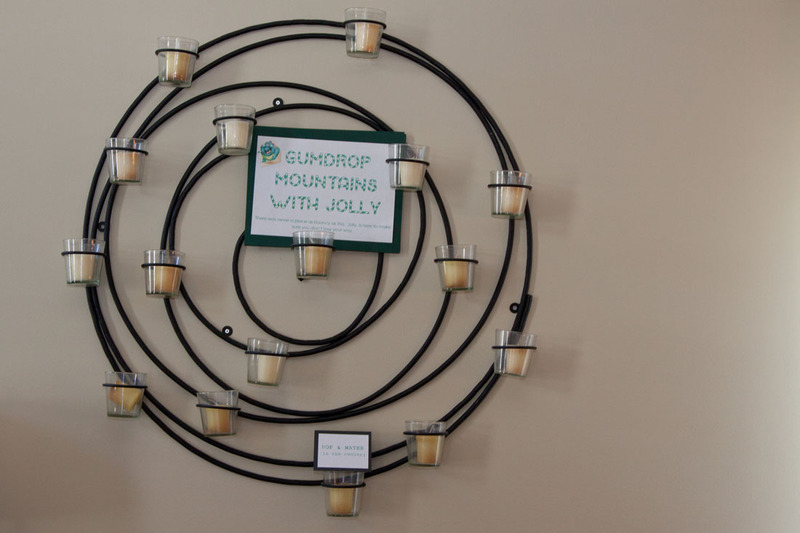 To make these, I glued wooden dowels (from Hobby Lobby) to paper plates. Then, I wrapped the plates in cellophane and tied it with ribbon. 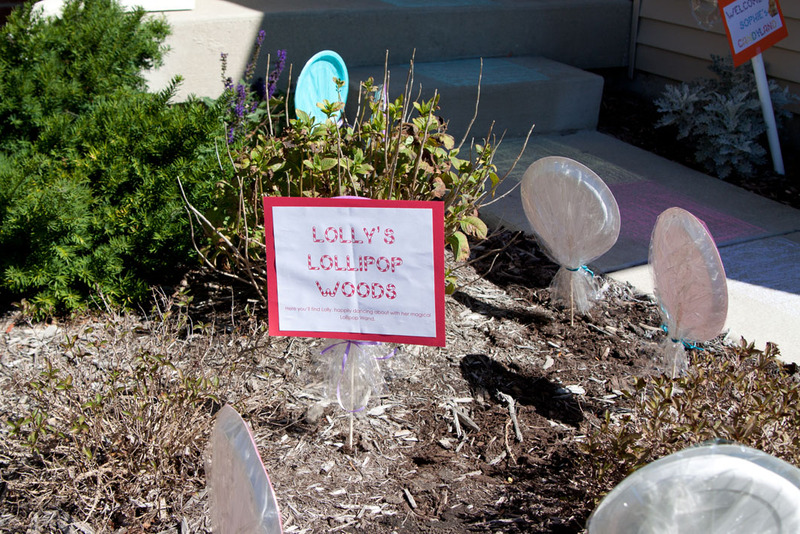 We placed some of these plates in “Lolly’s Lollipop Woods” (the front yard) and taped some to the walls in the house. 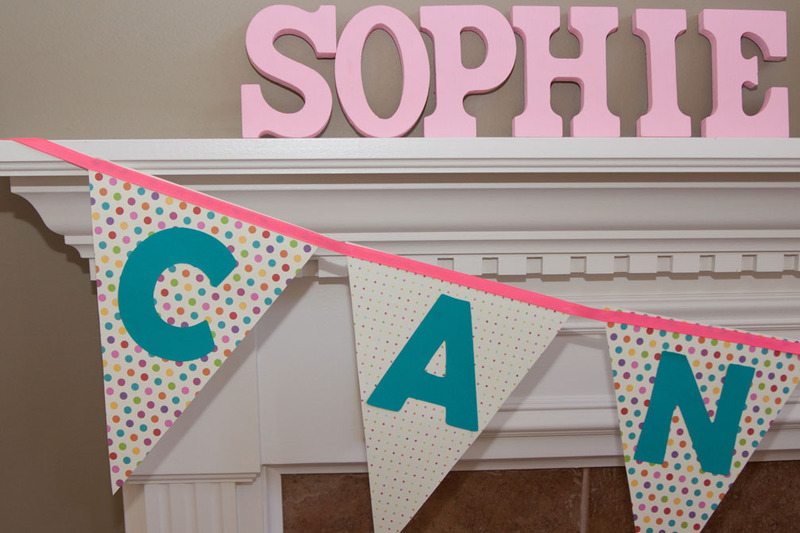 I had some wooden letters that spelled out “SOPHIE” and “FIVE”. 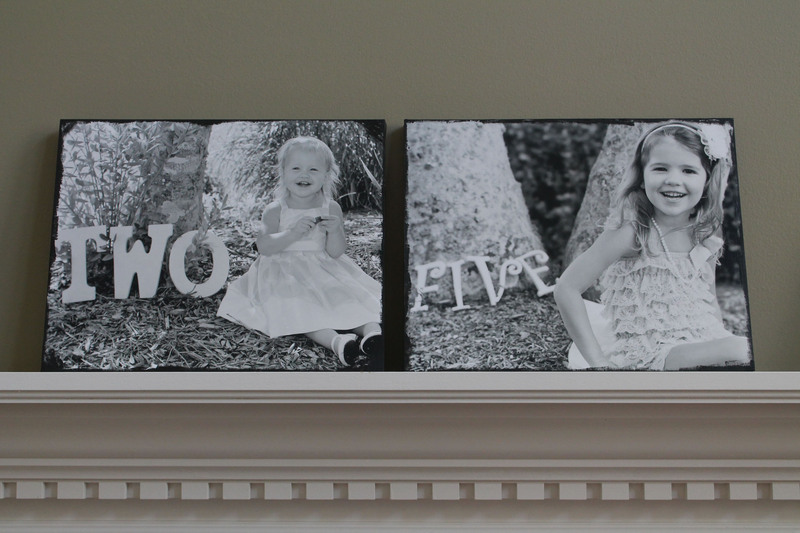 I placed these on the mantle of the fireplace along with a canvas photo of Sophie. 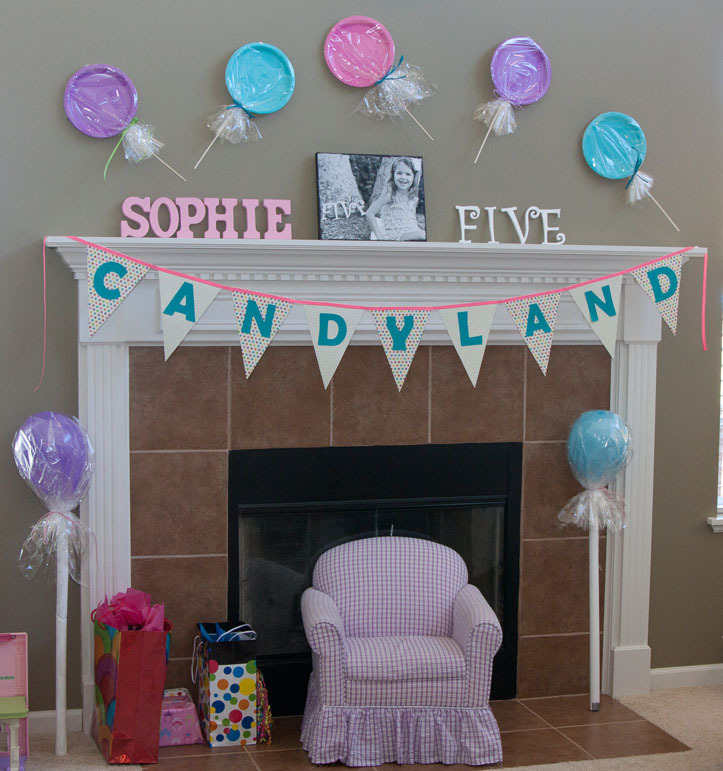 The lollipop plate decorations and banner completed the design. 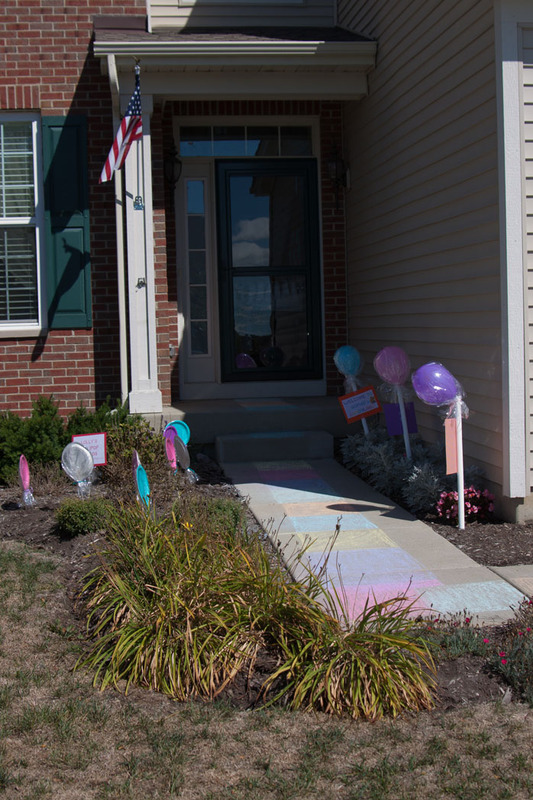 We decorated the front walkway and inside of the house with balloon lollipops. 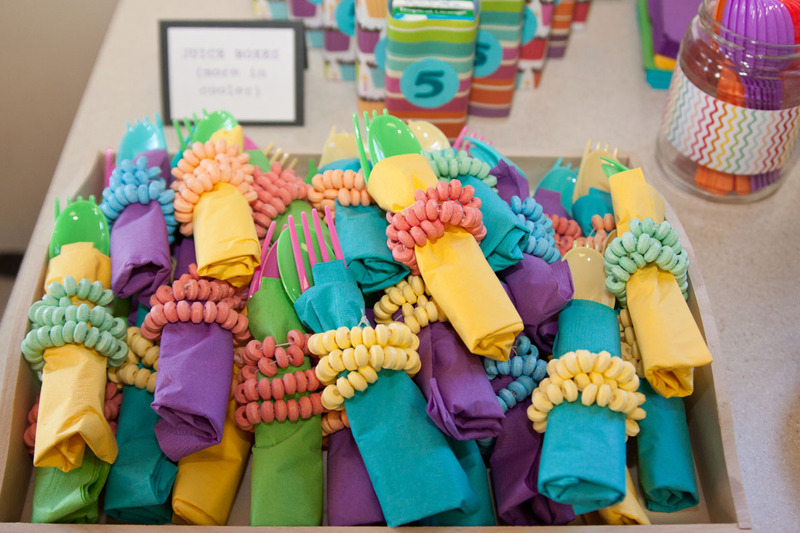 I wrapped the plasticware in napkins and used candy necklaces as a napkin ring. I served pirate booty and caramel/cheese popcorn in these “snack” cups. I dressed up these plain paper cups from Walmart with my alphabet stamps. 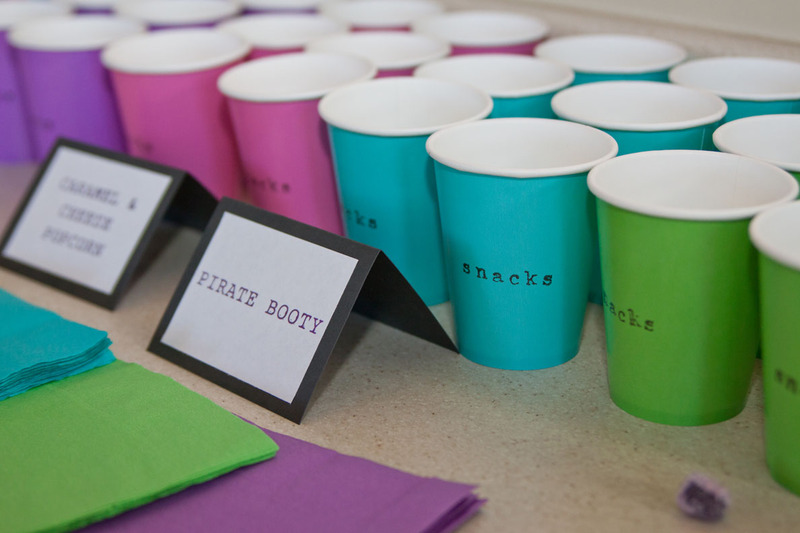 The cups read “snacks”. 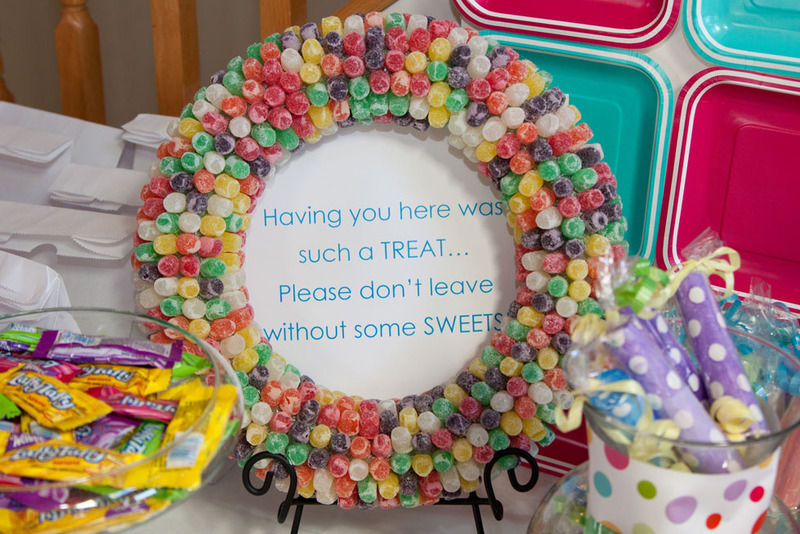 I used leftover gumdrops and sprinkled them all over the snack station. 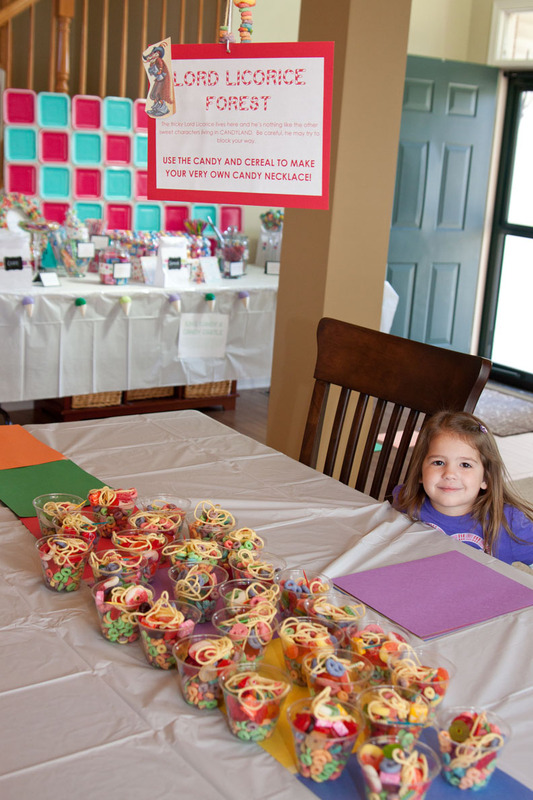 We labeled the dessert area “Cupcake Commons”. I made four varieties of cupcakes for the party. 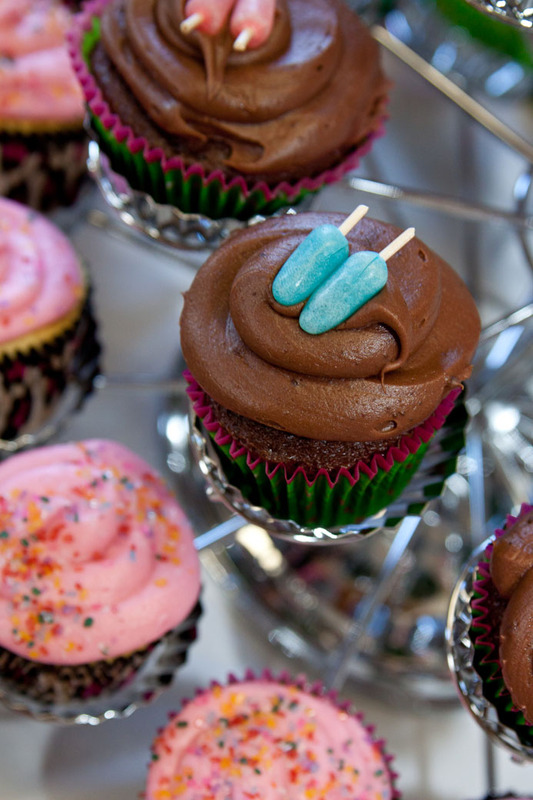 1 – Chocolate cupcakes with chocolate cream cheese icing ~ topped with “popciles” made of Mike ‘n Ike’s and toothpicks. 2 – Lemon cupcakes filled with lemon curd and topped with lemon cream cheese icing ~topped with styrofoam wrapped “candies”. 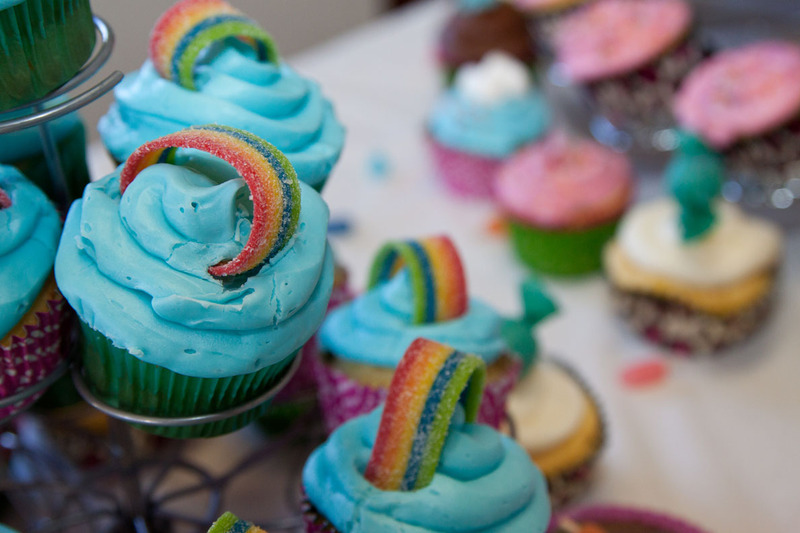 3 – Funfetti cupcakes topped with canned blue icing ~ topped with rainbow airheads. 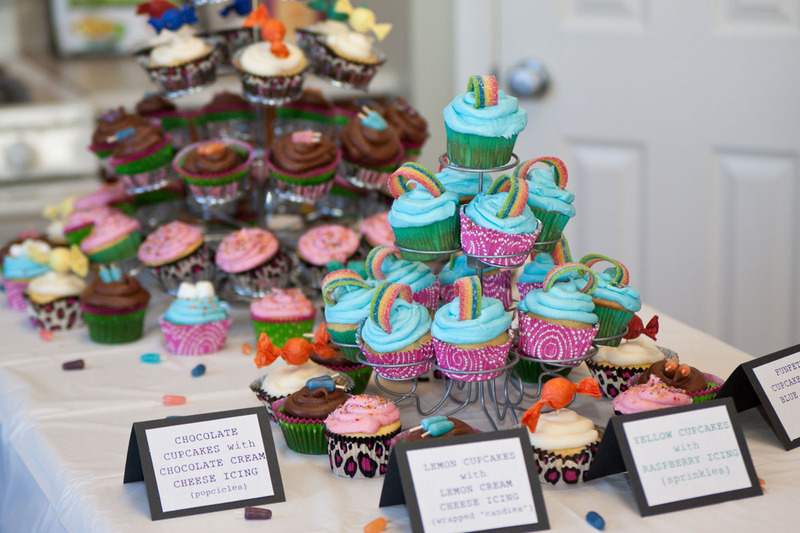 4 – Yellow cupcakes with raspberry flavored buttercream icing ~ topped with sprinkles. I purchased three types of ice cream. Sophie’s favorite is Superman. 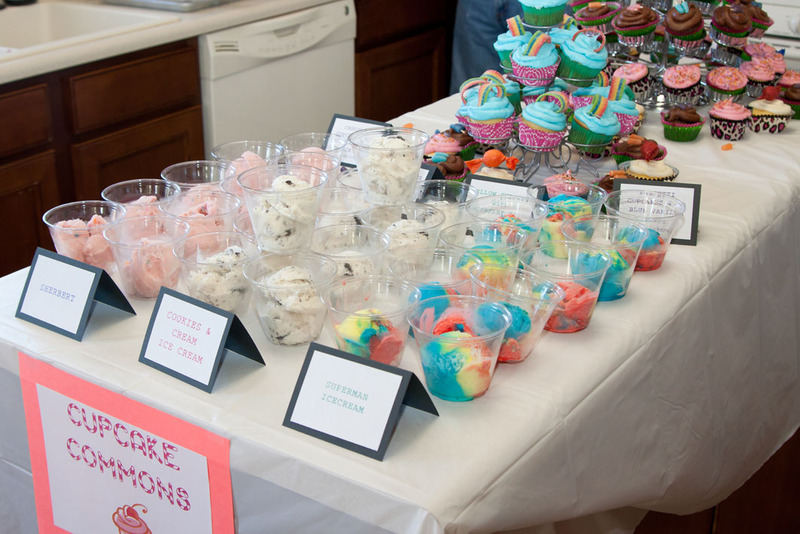 I also served cookie’s and cream and raspberry sherbert with sprinkles. 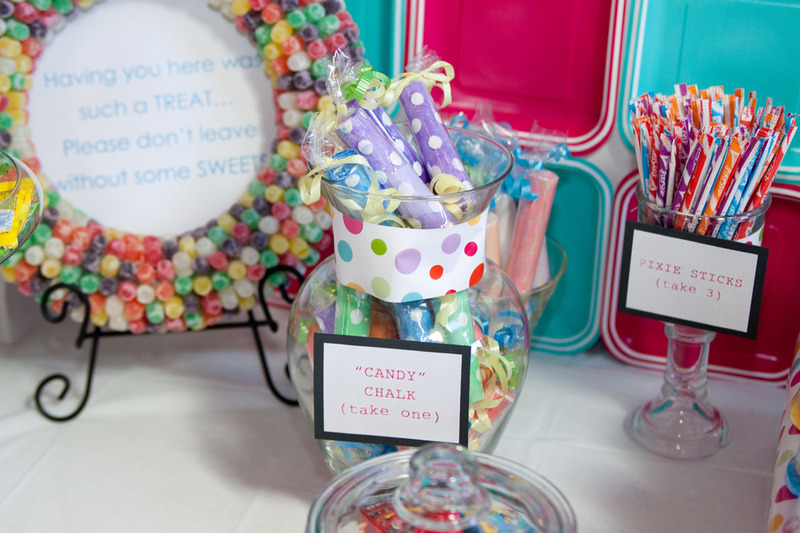 I created labels for the snacks, cupcakes, ice cream, drinks, and candy table. I printed the labels on regular printer paper and made a tent out of black cardstock. See picture above! I found cute cupcake Duct tape at Target to decorate the water bottles. No picture, sorry! 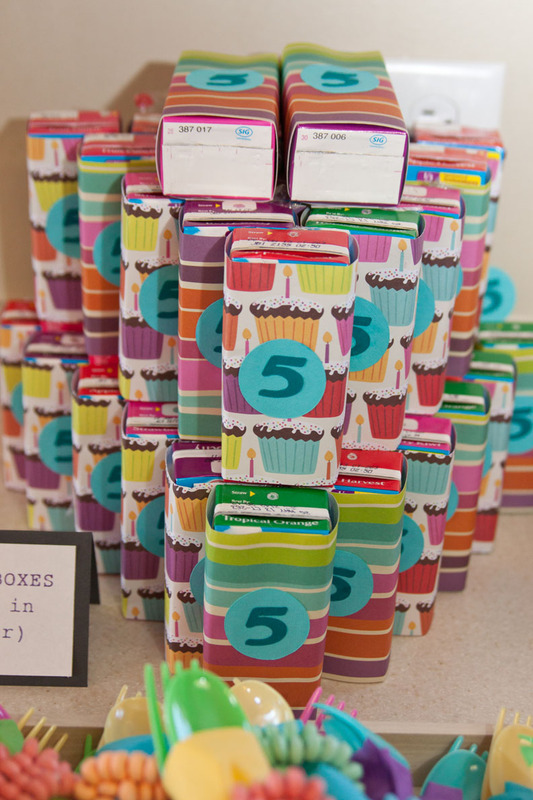 I wrapped the juice boxes in scrapbook paper and affixed a #5 that I cut out on my Cricut. I pulled off the straws before wrapping the juice boxes, and used a glue dot to re-affix the straw to the back of the juice box. 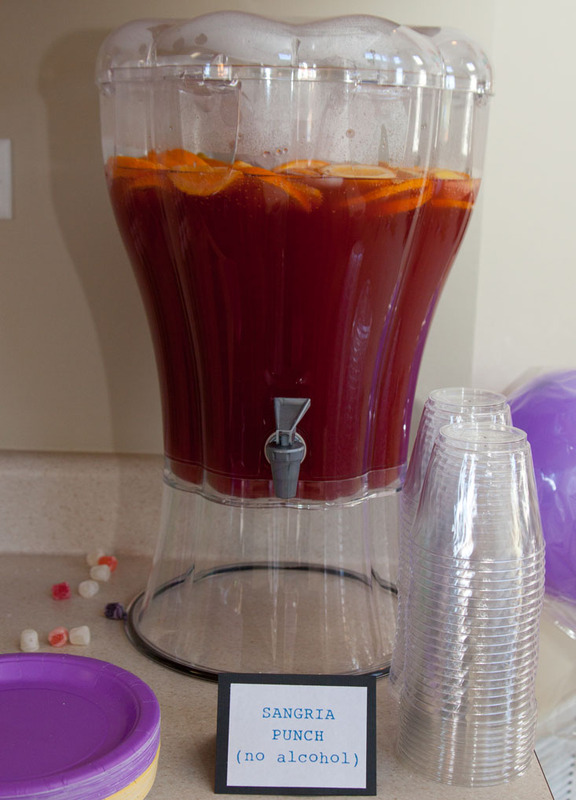 I filled my beverage dispenser with a Sangria Punch. I filled the cooler with water, pop, and extra juice boxes. 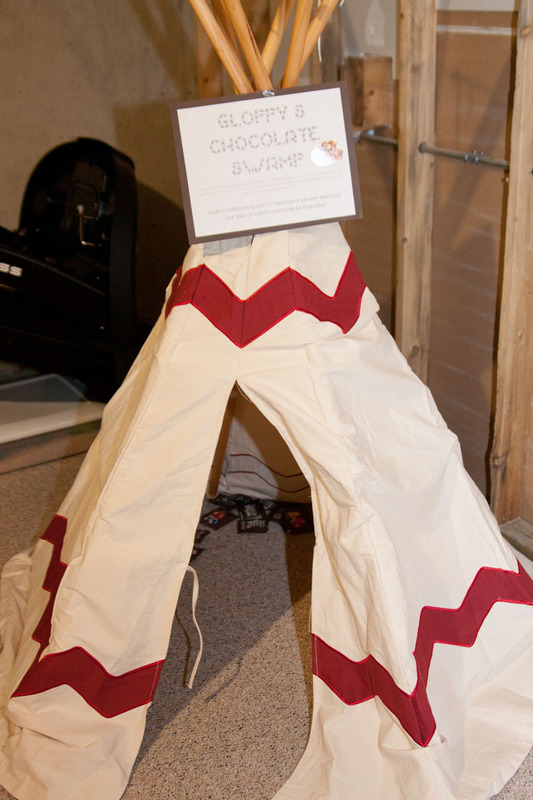 I tossed some fun-sized M&M’s into my girls’ teepee and labeled it “Gloppy’s Chocolate Swamp”. 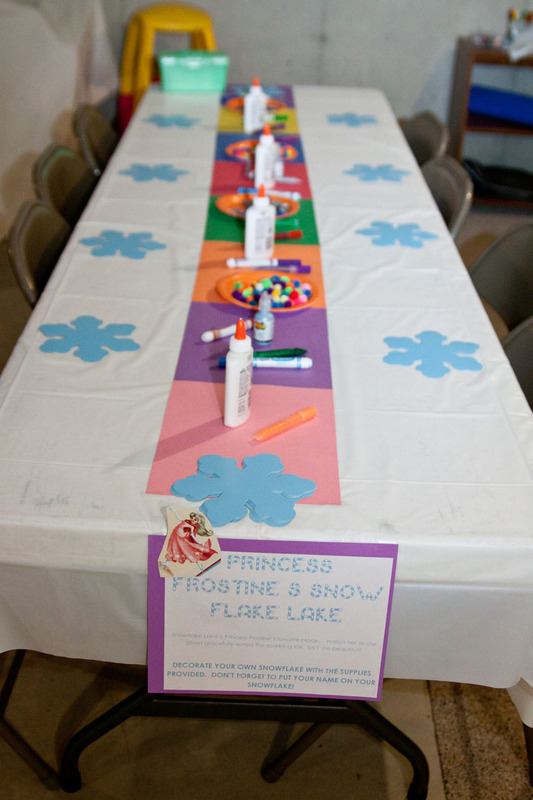 I setup a table where the kids completed a snowflake craft. I purchased paper snowflakes (from Hobby Lobby). 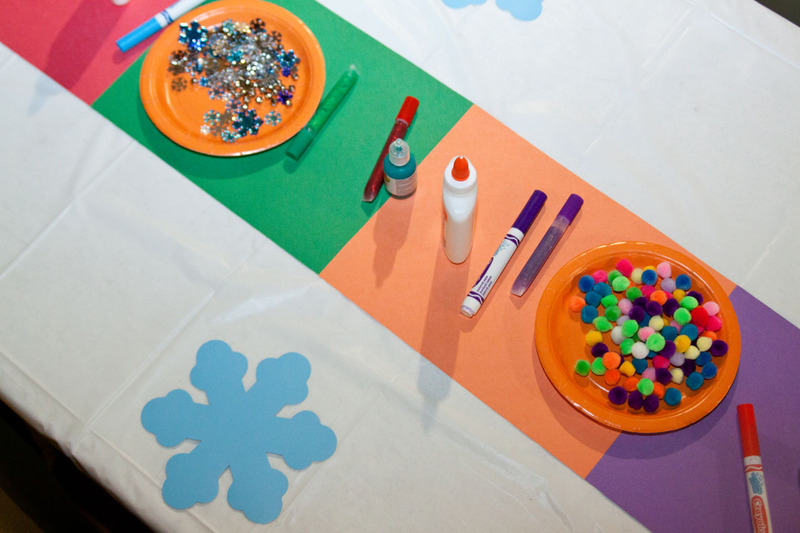 The kids decorated the snowflakes with sequins, bells, glitter glue, markers, puffy paint, pom pom balls, etc. 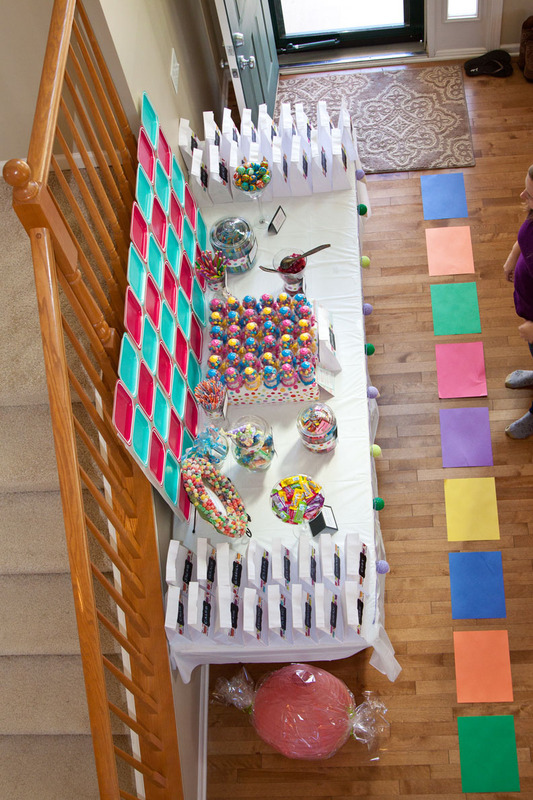 I covered most of the tables with white table clothes and lined the middle of the table with a construction paper rainbow trail. Lord Licorice’s Forest was setup at the dining room table. 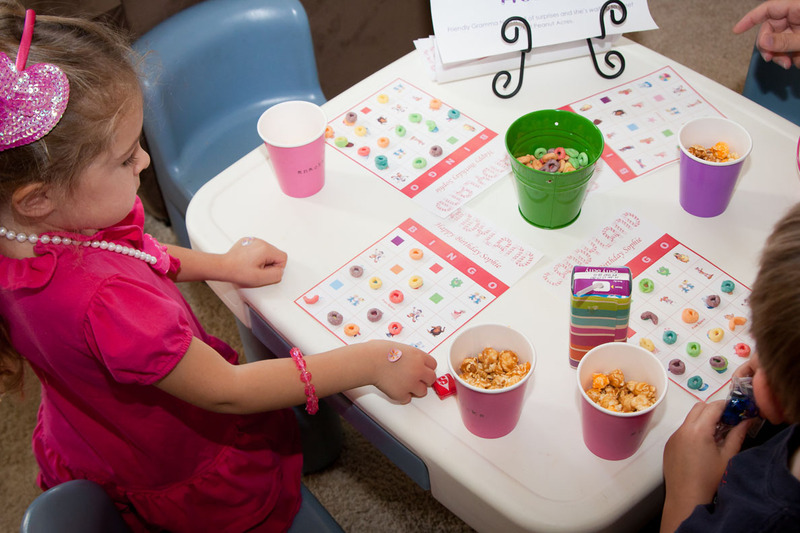 I prepared cups of candy and fruit loops so the kids could make their own candy necklace. 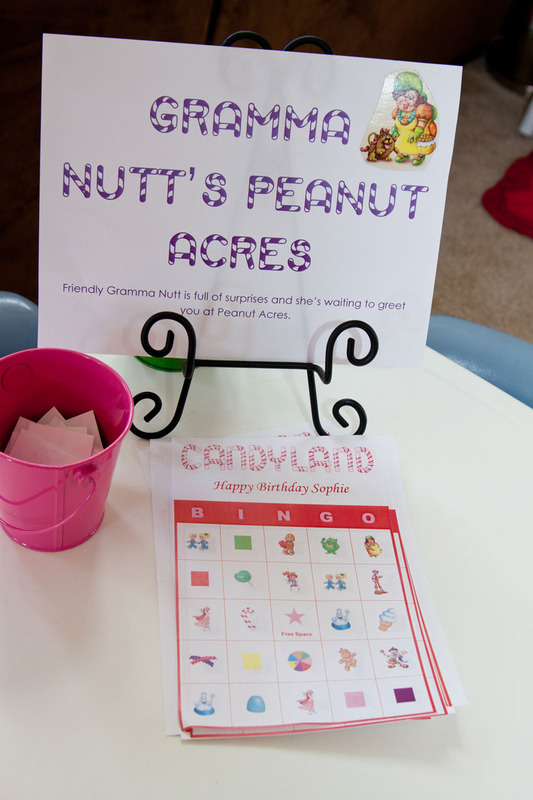 Sophie is allergic to peanuts, so I made Gramma Nut’s Peanut Acres into a BINGO station. I found a shop on Ebay that was selling a Candyland Bingo game. The kids really enjoyed this station. 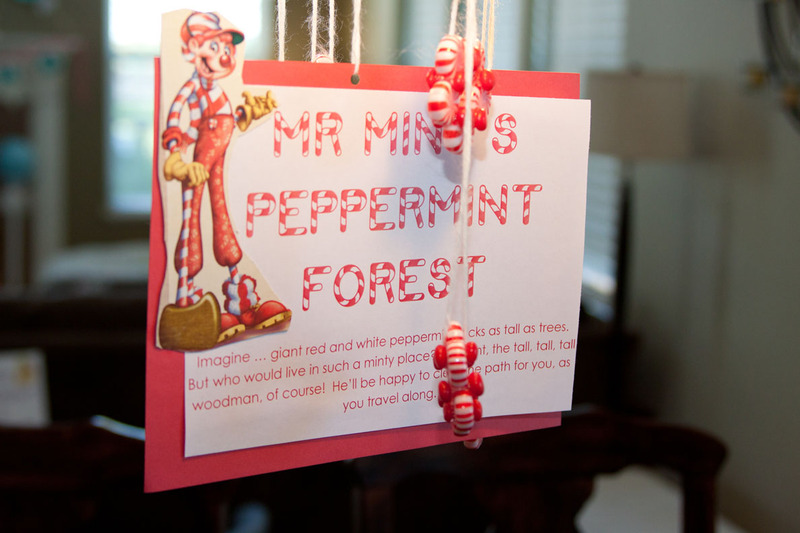 I made some peppermint ornaments to hang over the kitchen table. Originally, the party was going to be outside and these were to be hung from the patio table umbrella. 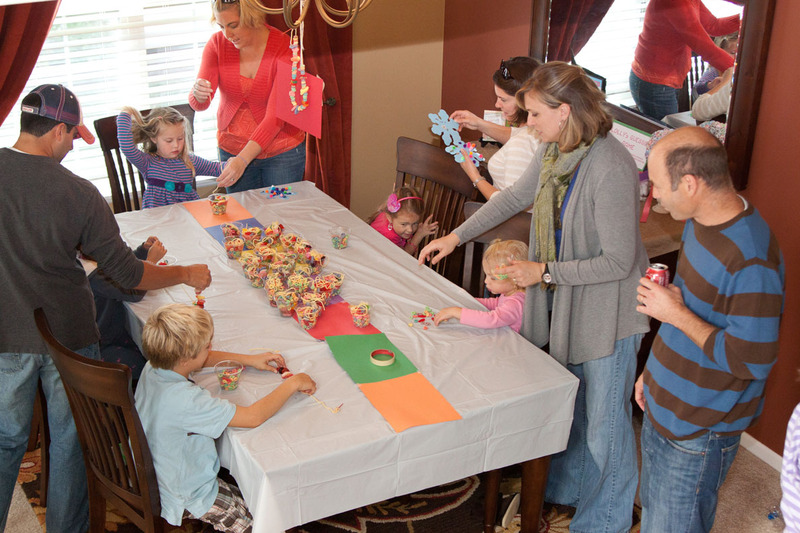 We covered the table with a tablecloth and sprinkled peppermints and lifesavers over top of it. 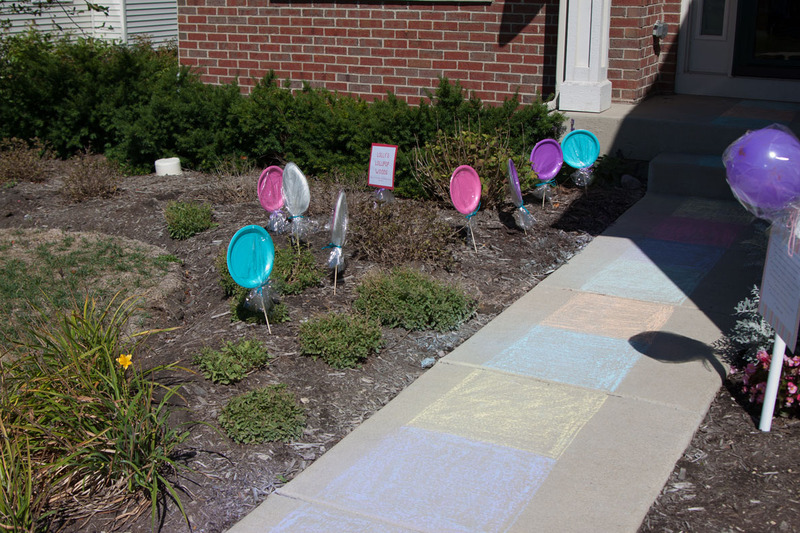 I had my sister (thanks Cindy) color a rainbow trail with chalk along the front walkway leading up to the front door. There was also a rainbow trail made of construction paper all over the foyer and kitchen. I made a bunch of gingerbread men out of foam and decorated them with pom poms. I decorated both sides so these guys could hang from the front tree. 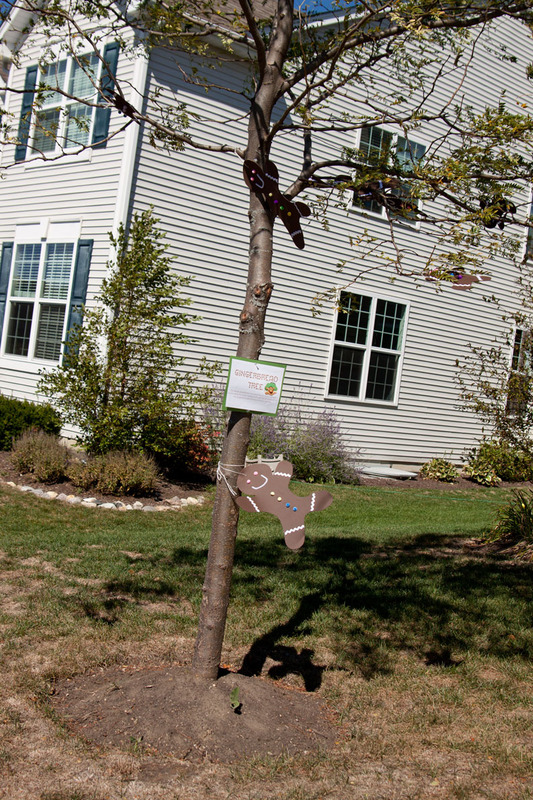 I used tacks to hang a sign from the tree. 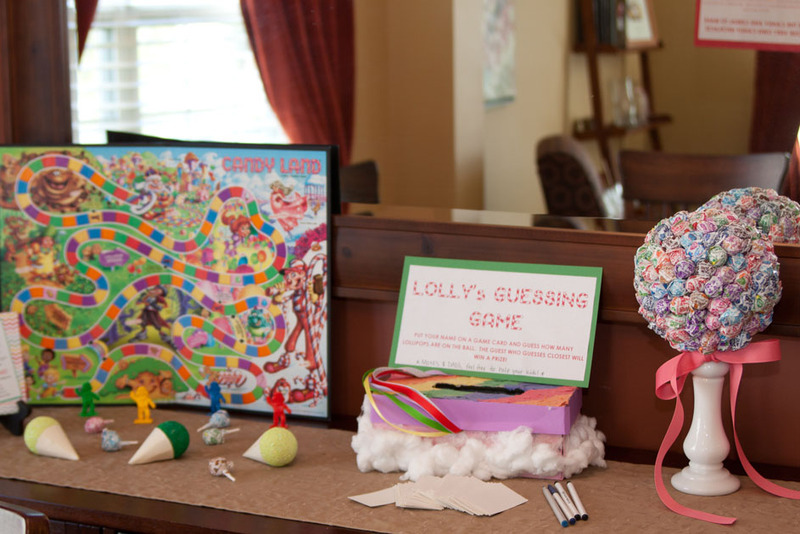 I created “Lolly’s Guessing Game”. 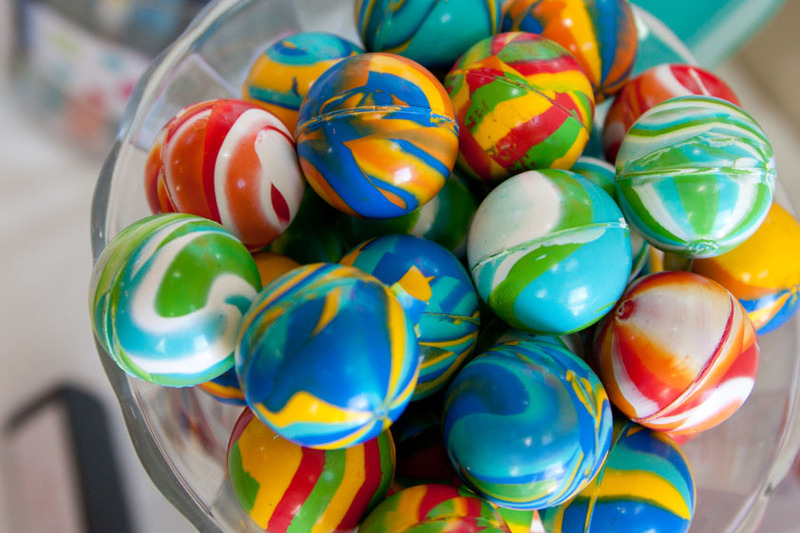 Each kid guessed how many lollipops were on the ball. The closest guess won a miniature version of the decoration as their prize. The kids wrote their guesses on cards from the Candyland game. 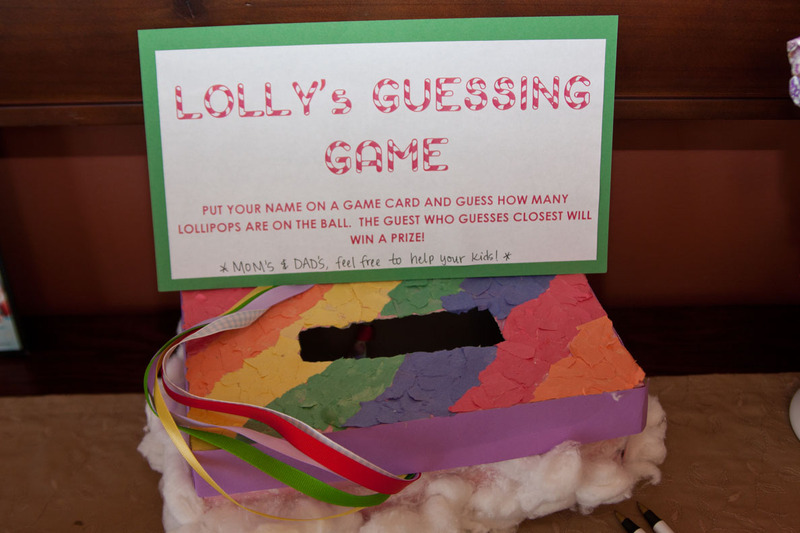 The guesses were placed in a shoe box decorated as a rainbow (from last valentine’s day). 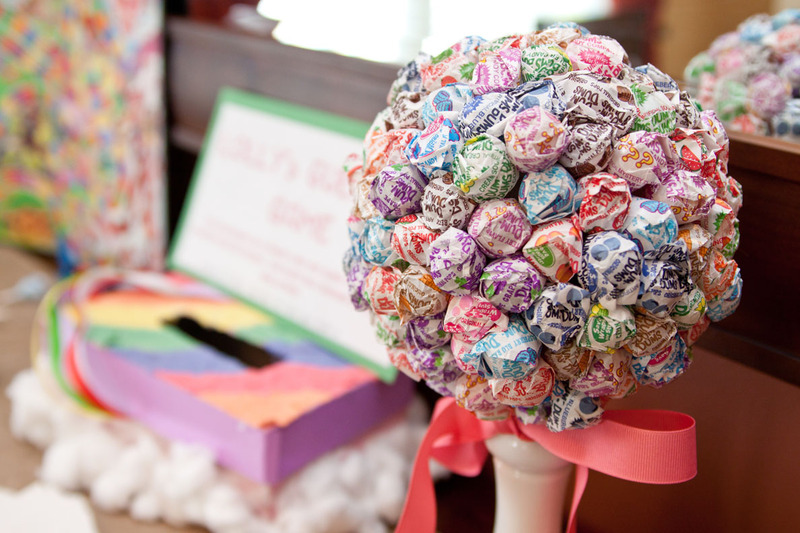 The total number of dum dums was 165, and one lucky girl guessed 168. 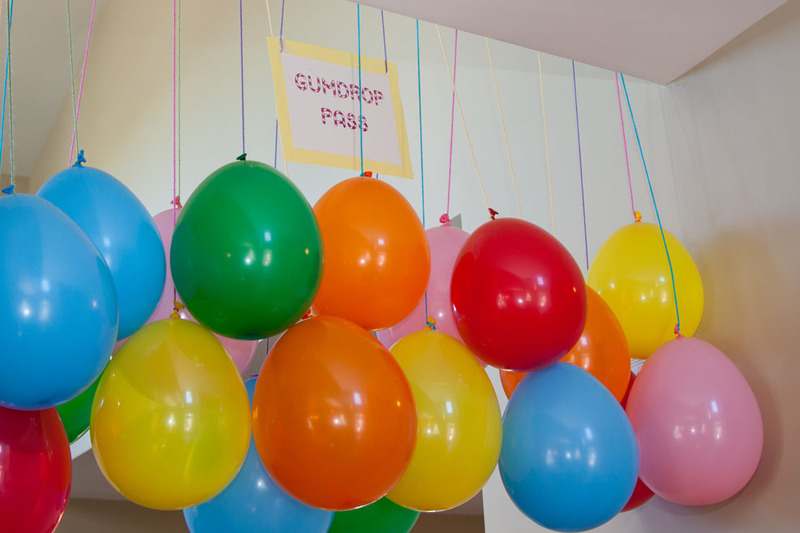 I hung balloons upside down in a doorway and labled it “gumdrop pass”. 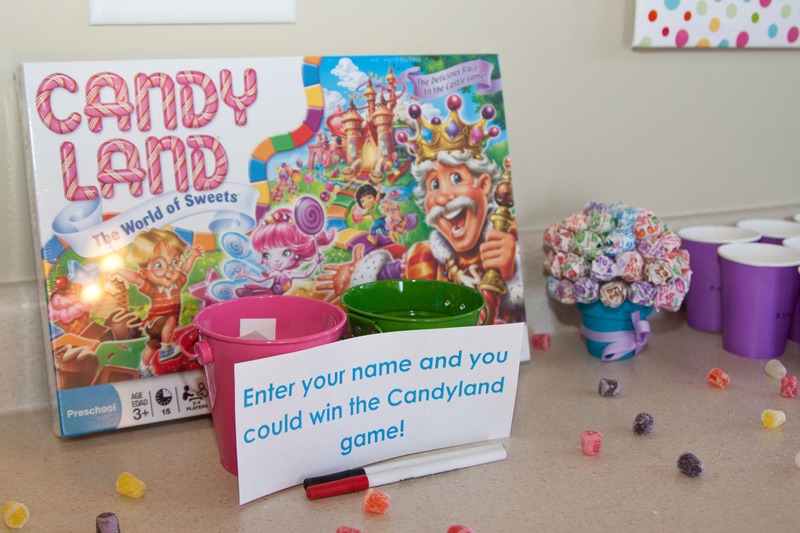 I had everyone enter their names to win the Candyland game. There was one lucky winner who went home with the game! 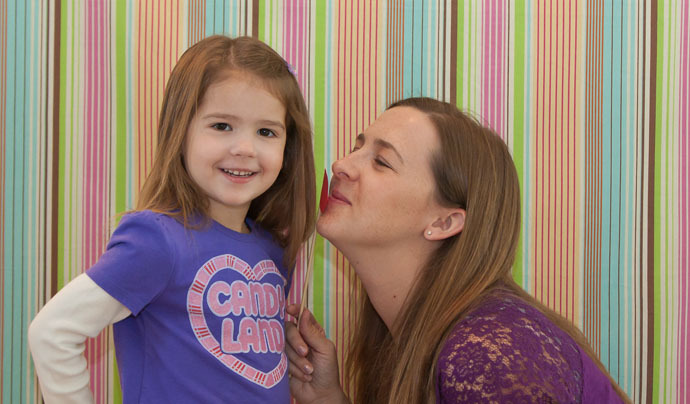 My sister is a photographer and she contributed a Candyland themed photobooth. We set this up in the upstairs hallway. 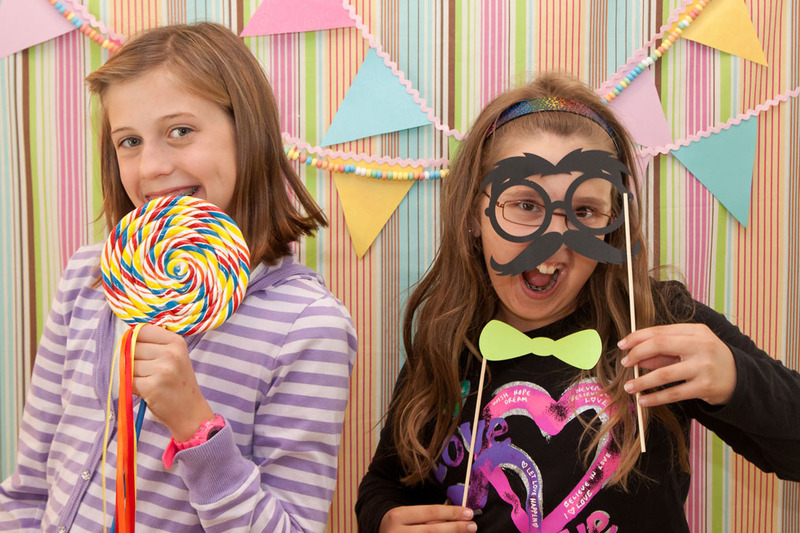 The kids LOVED getting their pictures taken with all the fun props. This may have been the best part of the party!! 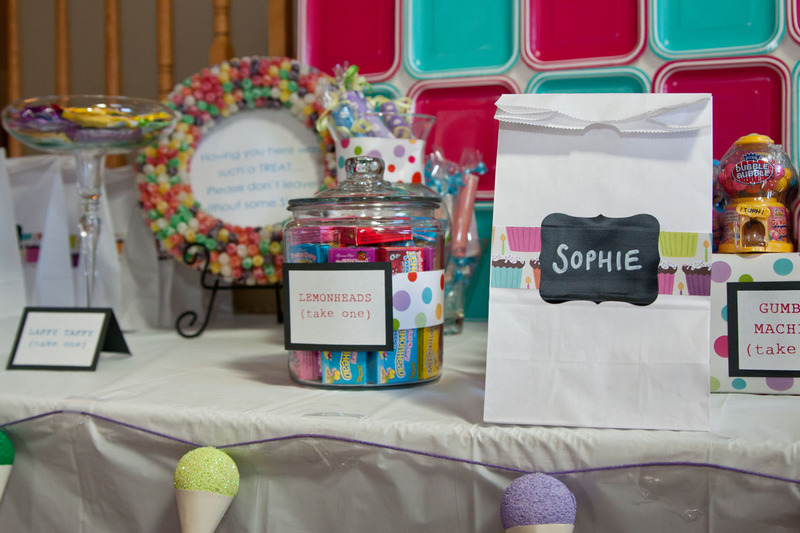 As the party favor, each kid received one empty goody bag labeled with their name. 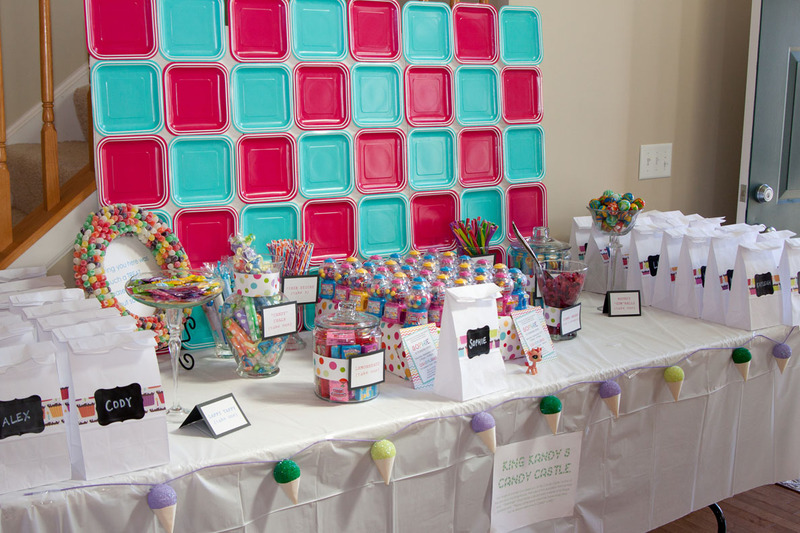 At the end of the party, the kids filled up their bags with the items displayed on the candy table. To make the goody bags, I purchased plain white lunch bag sized bags. I cut a strip of scrapbook paper and glued it to the bag. Then, I used my Cricut to cut out chalkboard contact paper name tags. 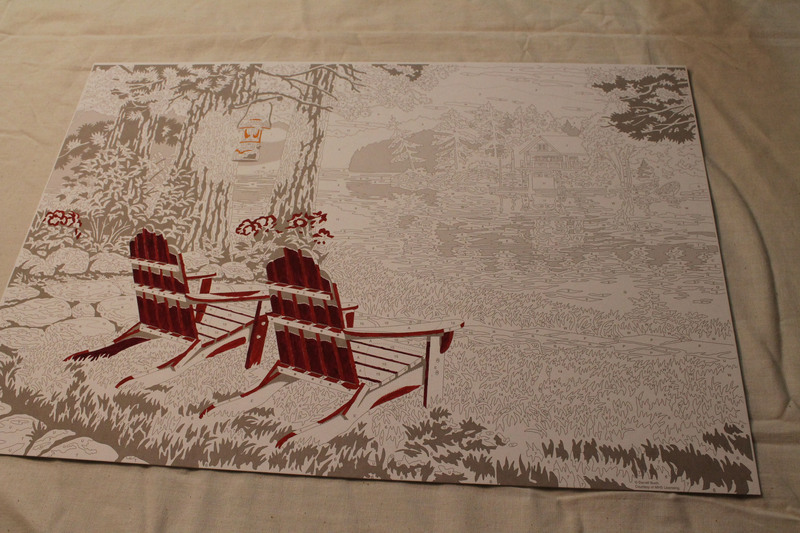 (This was the very last project I will ever do on my Cricut because I’m replacing it with the Silhouette Cameo. RIP Cricut, you have been good to me.) I affixed the contact paper to the bag and wrote each guests name with a white chalk marker. 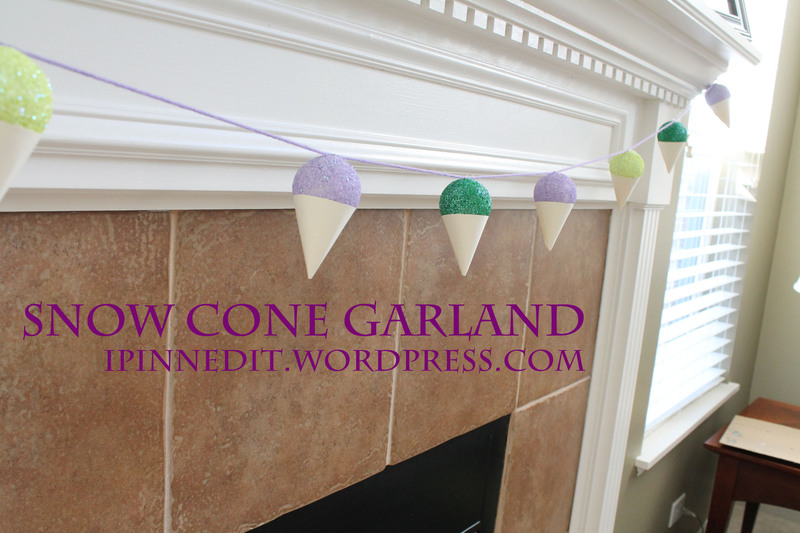 I hung a snow cone garland from the candy table. 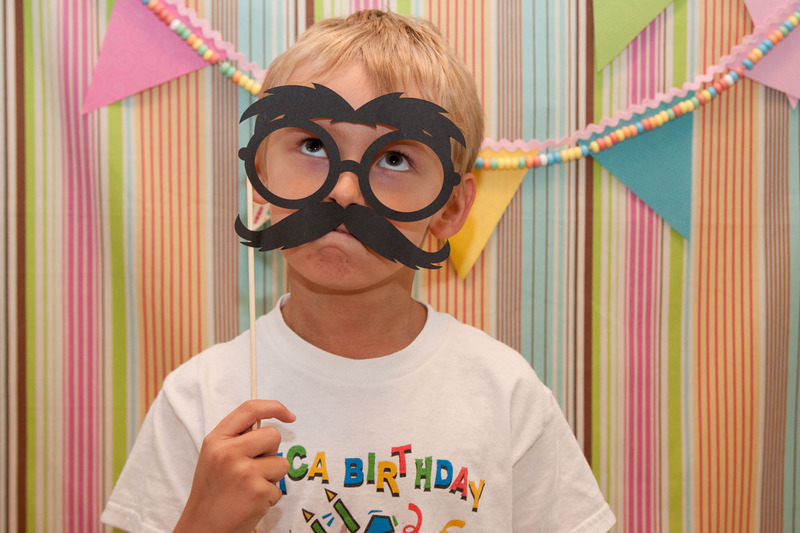 I created a backdrop made of square paper plates from Target. I had some foam boards and I glued on the paper plates to create the backdrop. I think it turned out pretty awesome! Well, due to rain and wind, we had to move the party inside. We were going to have a bounce house in the backyard which would have been Gumdrop Mountains with Jolly. I hung the sign over the cooler instead. Not as much fun, but Jolly was still represented! A HUGE THANKS TO MY SISTER CINDY WHO HELPED SETUP THE PARTY. SHE ALSO TOOK ALL THE PICTURES AND SETUP THE PHOTOBOOTH!!!! THANKS TO MY MOM WHO HELPED ME PUT TOGETHER SOME LAST MINUTE DECORATIONS. LOVE YOU GUYS!!!! 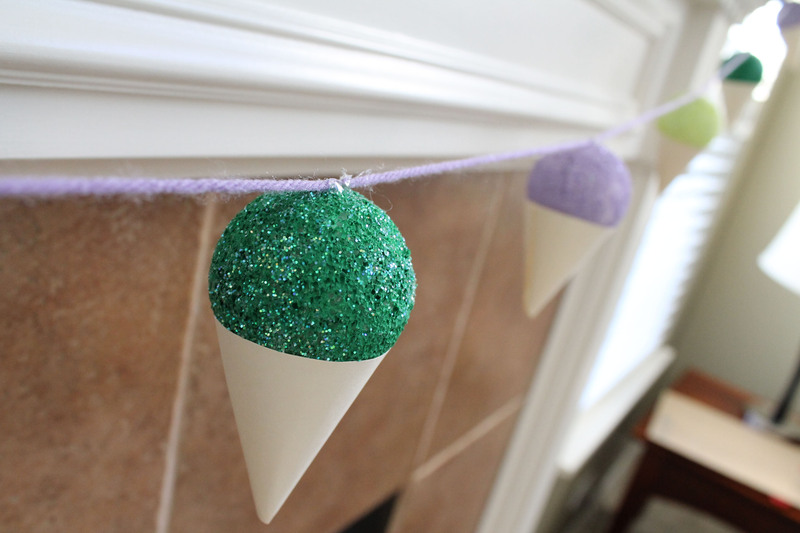 Another decoration I made for the Candyland party is this precious snow cone garland. I’m going to hang it from the mantle of my fireplace and place the gifts below it. 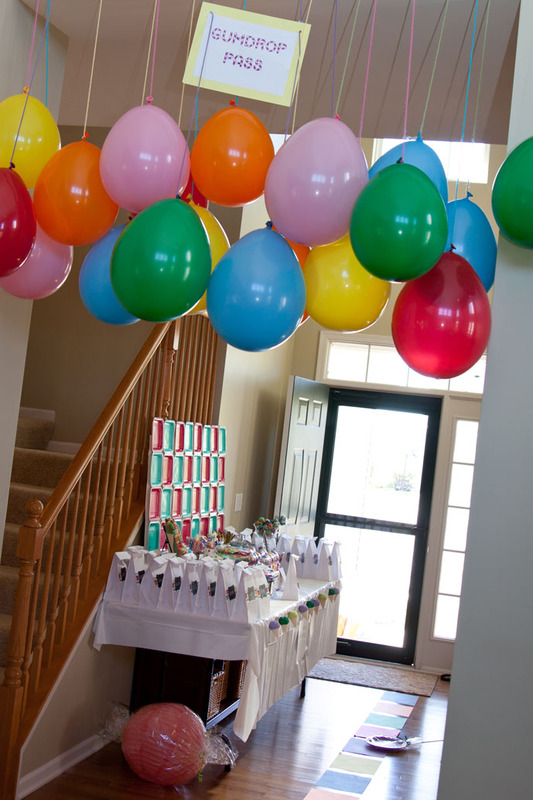 I plan to take apart the garland after the party and use the individual snow cones to decorate wrapped gifts! 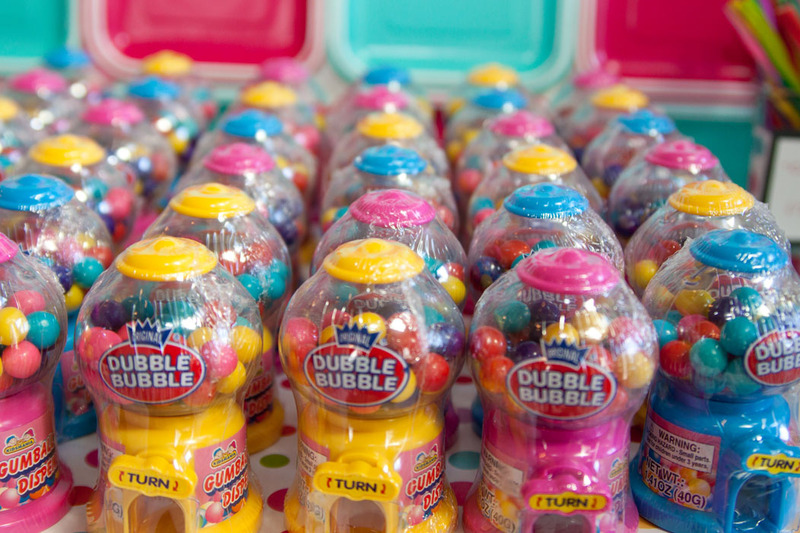 1) 1.5 or 2″ styrofoam balls. 9) Styrofoam block – to hold balls while they dry. (1) Collect all of your supplies. 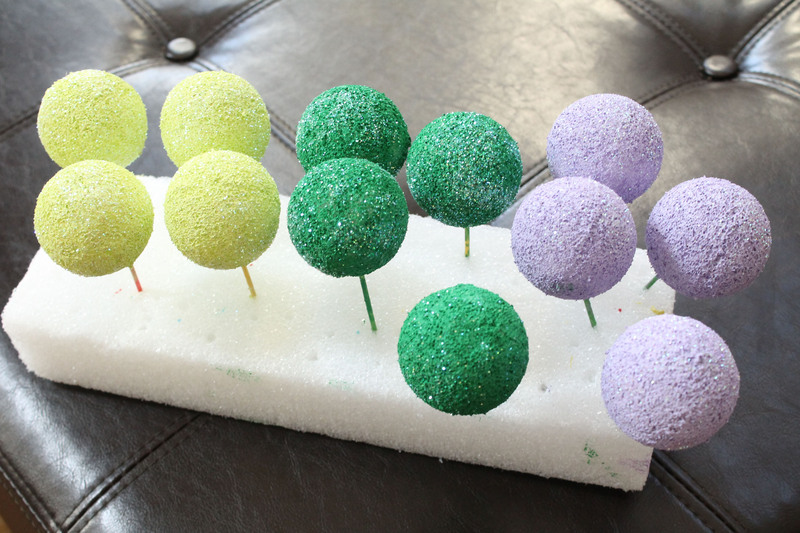 (2) Place toothpicks into each styrofoam ball. (3) Use brush to paint each ball with acrylic paint. (4) Insert balls into styrofoam block to dry. 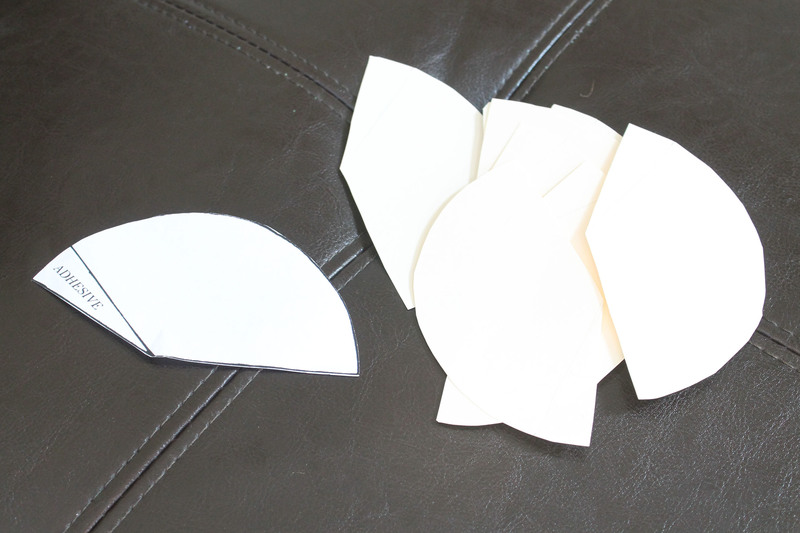 (5) Cut out as many paper cones as you need using the template. (6) Warm up your glue gun on the LOW setting. If you use high, your fingers will burn. 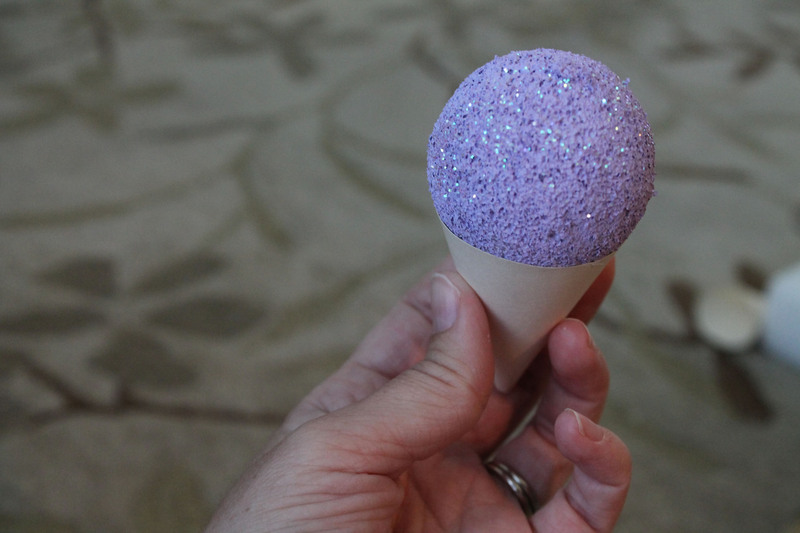 (7) Create a cone shape and glue it together. Repeat until you have enough cones. 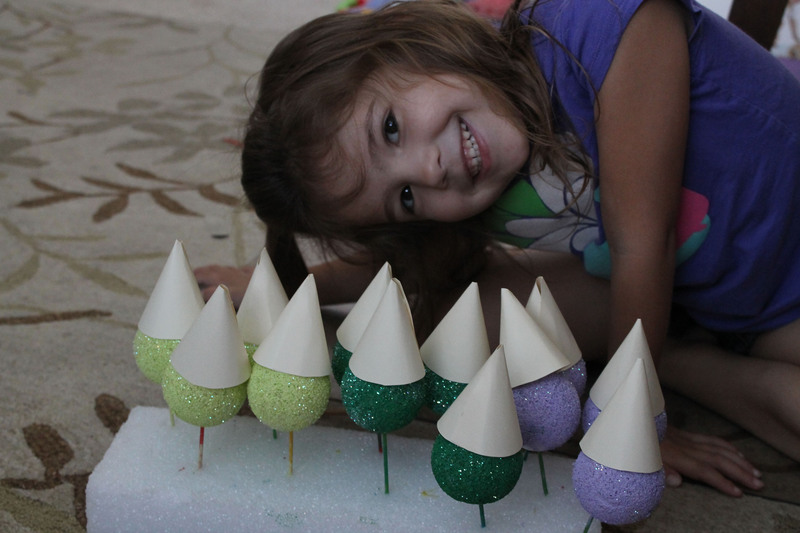 (Note: Once Sophie placed all the cones on the balls like so, I thought these would work good for a Circus themed party as clowns). 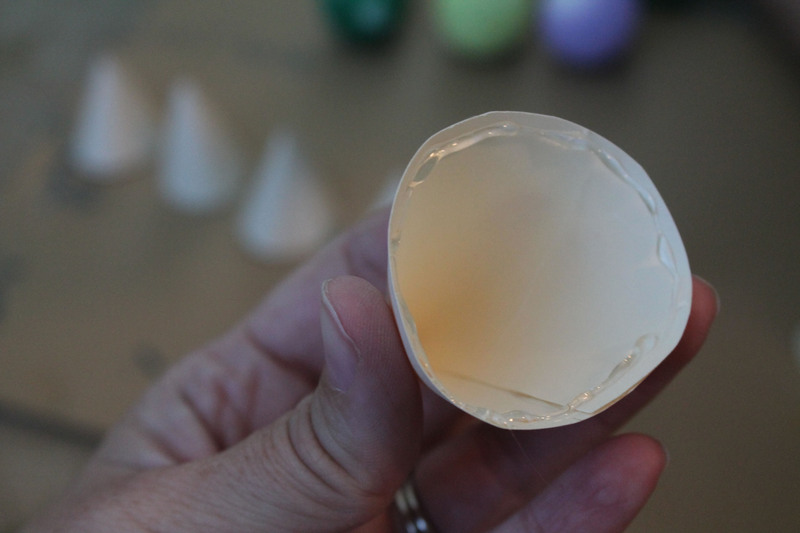 (8) Place a ring of glue on the inside of the upper portion of the cone. 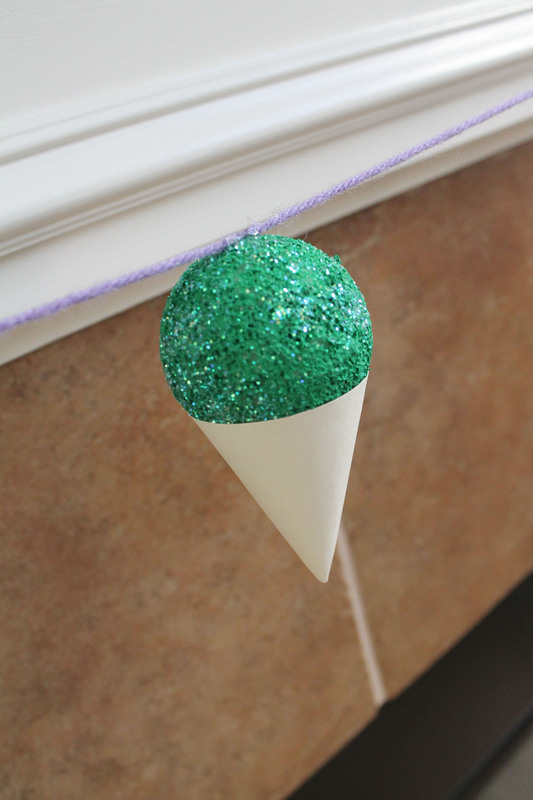 (9) Quickly insert painted styrofoam ball in place. Repeat for all cones. (10) Measure out the amount of string or yarn you need. 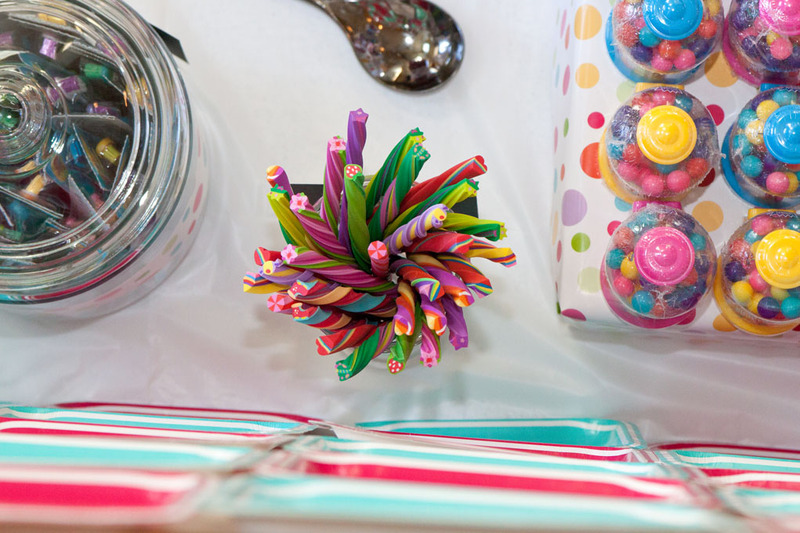 (11) Start gluing the the top of each ball directly to the yarn or string. 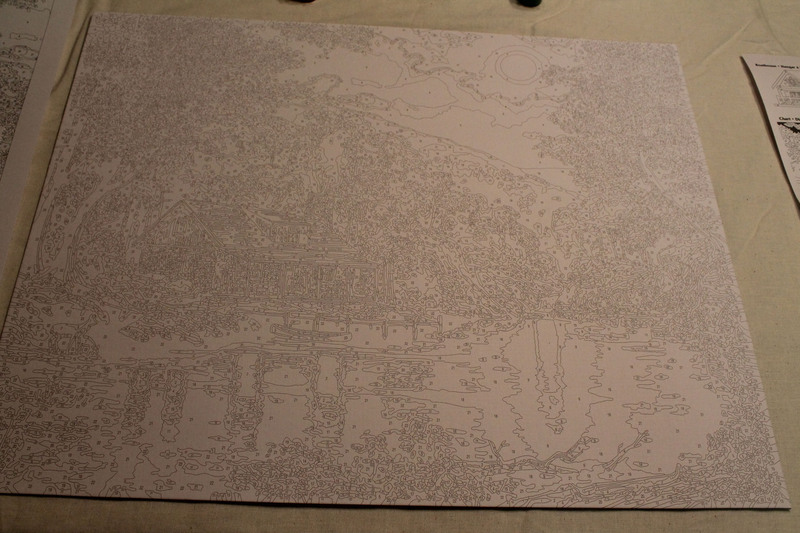 (12) Allow the glue to dry for a few minutes and you are all done! Time: 20 minutes to paint 12 2″ balls, plus 25 minutes for the rest of the project. 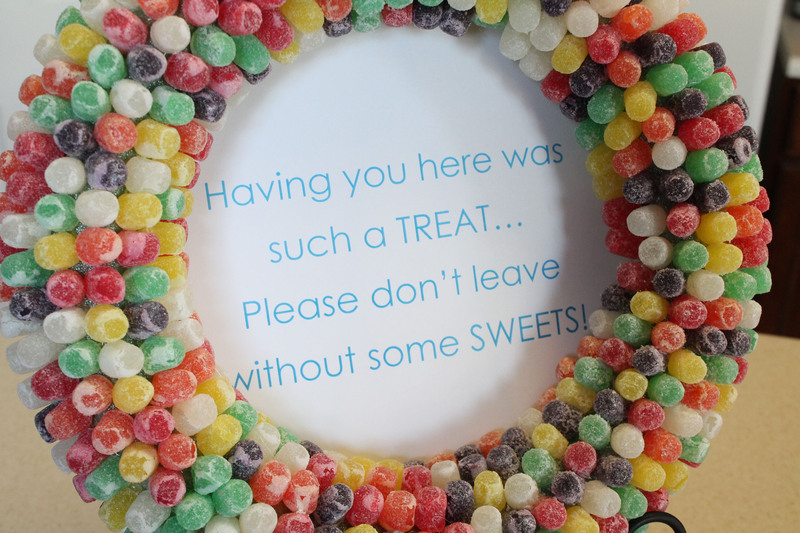 I made this cute gumdrop wreath for Sophie’s Candyland party. It was a very simple project. 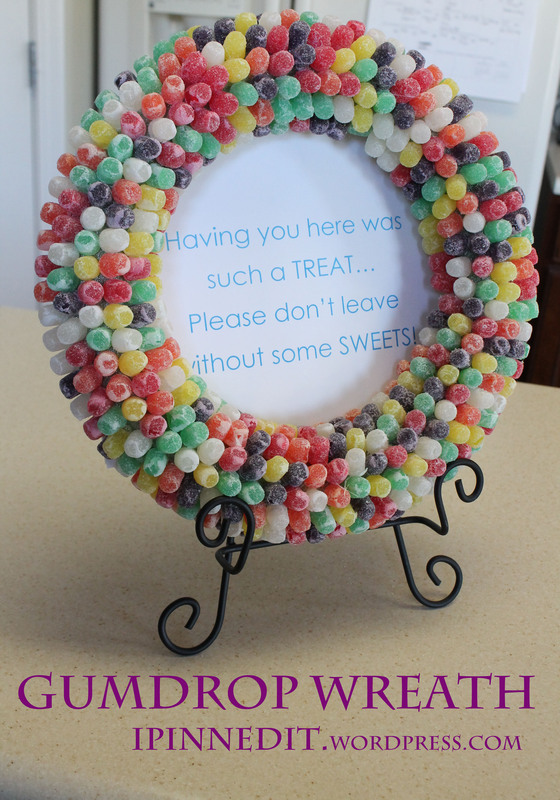 All you need is a foam wreath, a few bags of gumdrops, and hot glue. Make sure to use the “low” setting on your glue gun or you might end up with some burns! I didn’t glue the gumdrops all the way around the wreath because I’m going to display it on King Kandy’s Candy Castle table with all the sweets. Check out the fun sign that I placed inside the wreath. I used a few sewing pins to attach the sign to the wreath. My sister recently took a bunch of amazing photos of my two girls. 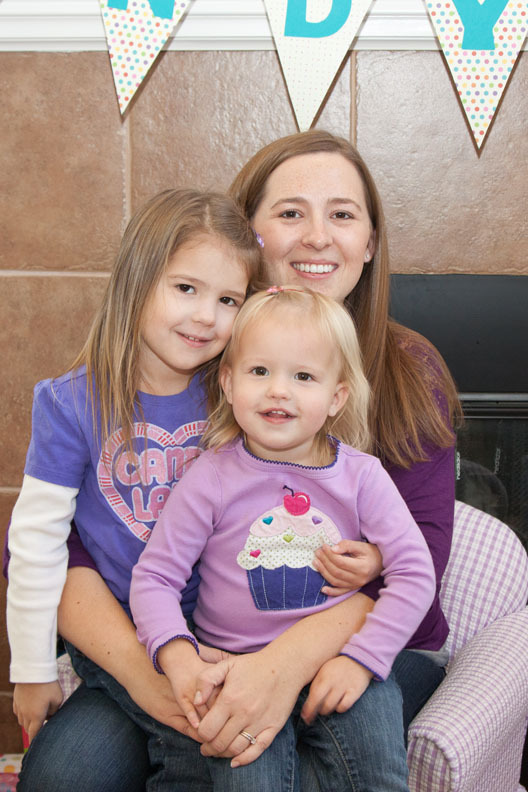 Molly turned two last week and Sophie will be five next month. I had two 11 x 14 sized poster photos printed to try a DIY Canvas Photo. I’m so glad I tried this out. These turned out awesome and took center stage on my mantle. I can’t stop staring at them! 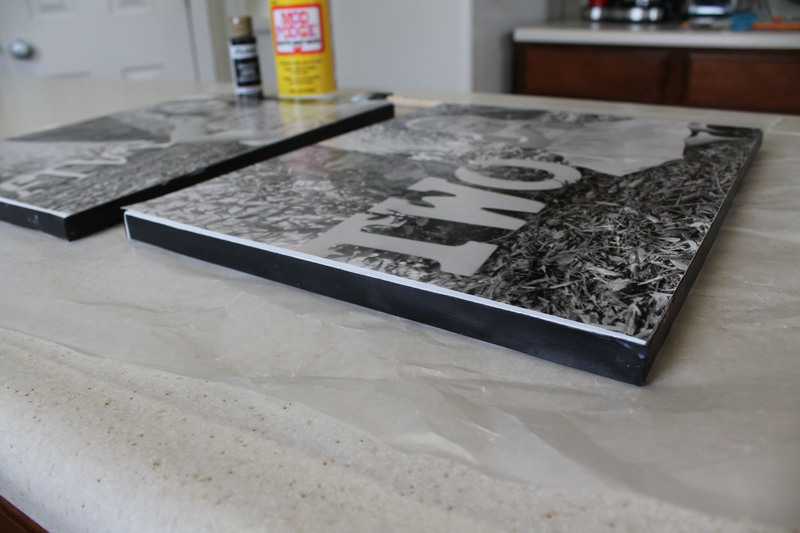 I really think the black acrylic paint added a nice finish to these canvas photos. They really look professional! Time: 40 minutes hands on time + drying. 1.) 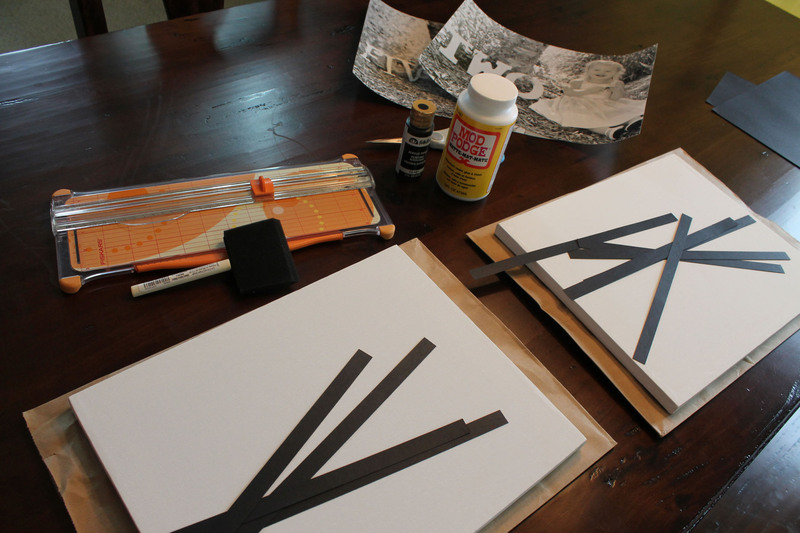 Cut strips of scrapbook paper to fit the sides of your canvas. 2.) 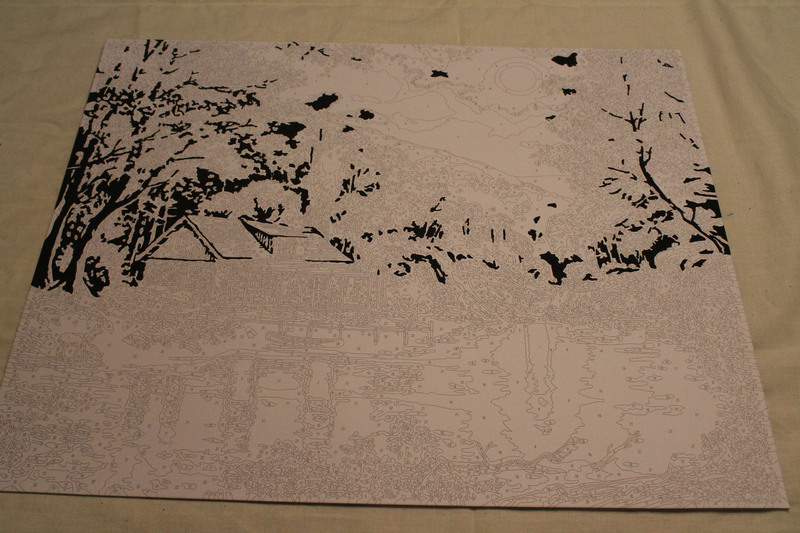 Mod podge one side of the paper strip and apply to your canvas. Then, apply a top coat of mod podge. 3.) 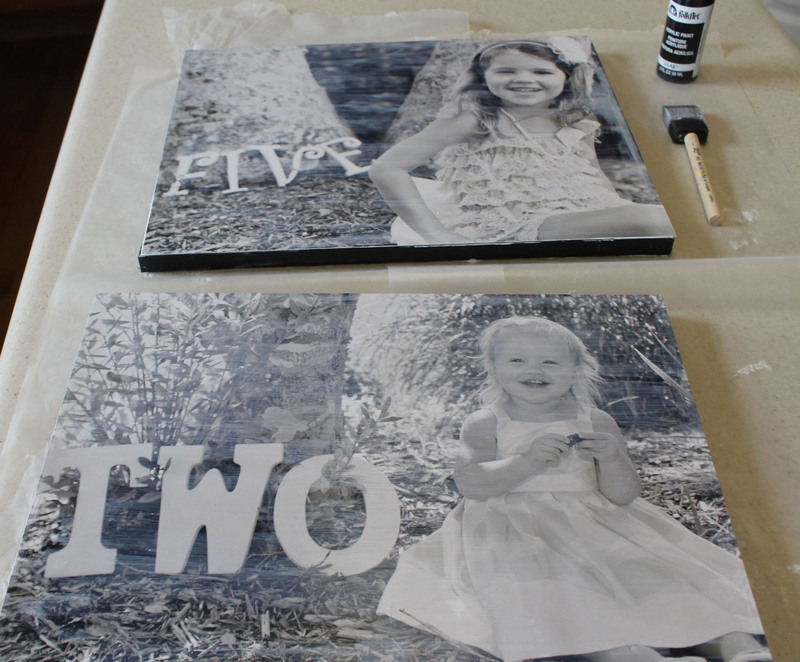 Apply a layer of mod podge to the top of the canvas and glue on your photo. 4.) Allow to dry completely. 5.) 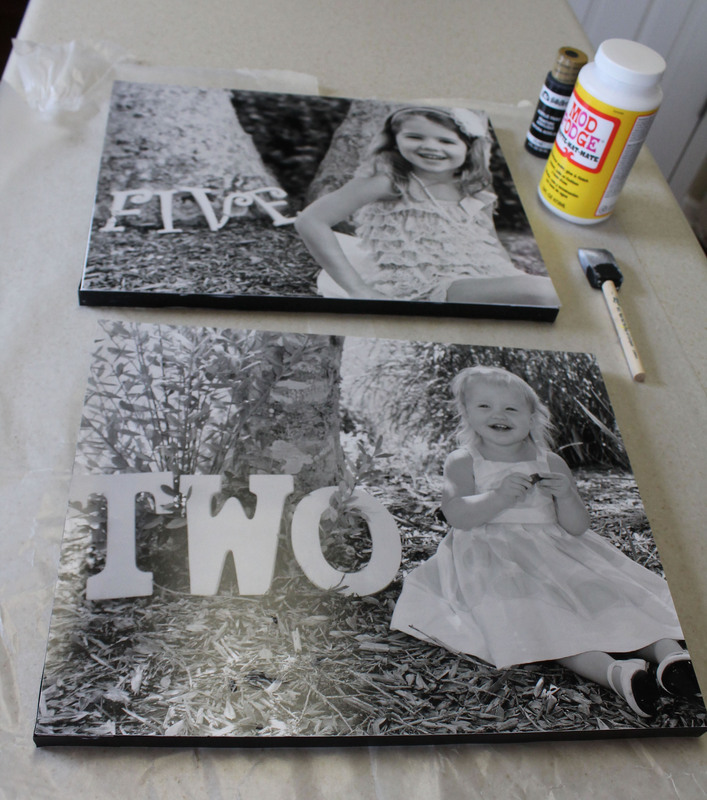 Apply a layer of mod podge all over the top of the photo and sides of canvas. 6.) Allow to dry again. 7.) I used the same sponge brush and blotted on black acrylic paint around the boarder (I filled in any space the scrapbook paper didn’t cover up). 8.) Allow to dry and you are done! I have dreams of a gallery wall in my upstairs hallway, and know I have inspiration to get it started! My family will be spending a good amount of time traveling this summer, so I’ve been researching ideas for keeping the kids happy in the car, airplane, at dinner, etc. The first project I prepared is this cookie sheet magnet board. I had a bunch of these wooden figures (animals, bugs, nature, etc.) on hand as wells as some magnets. I just hot glued the magnets to the back of the wooden figures and placed them on a cheap cookie sheet. I purchase a set of three at WalMart for about $5. I’m going to hide it away and only bring it in the car when we have a long trip ahead of us. 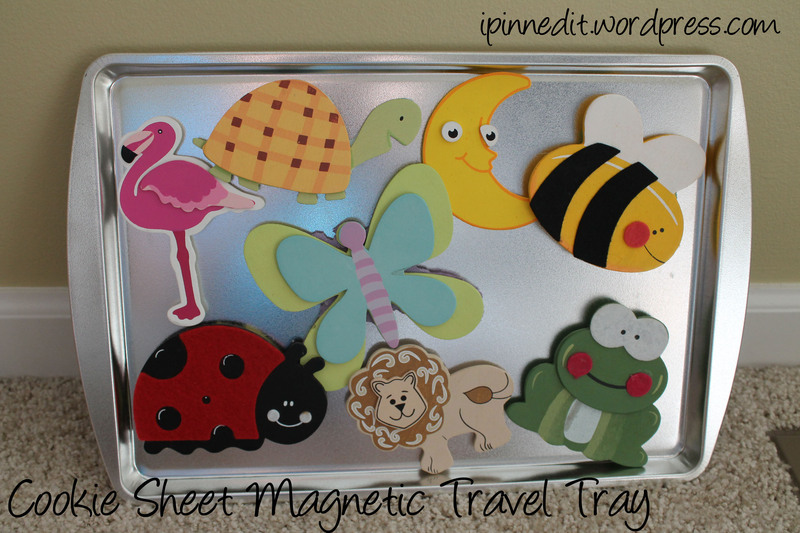 The best part of the cookie sheet idea is that they can be used for many purposes such as magnet board, dinner/lunch tray, a hard surface for coloring, etc. I’m going to spray paint two of these cookie sheets with chalkboard paint and the kids will use them as mini chalk-boards. I will definitely keep a pair of these cookie sheets in our car for long road trips. Time: 10 minutes. This was a really fast project.